Severe thunderstorms moved through Uganda on Thursday sending over 7,500 lightning strikes during the evening hours. Earlier in the day, high frequencies of lightning in Eastern Congo and Western Uganda prompted Earth Networks Total Lightning Network to send out 10 Dangerous Thunderstorm Alerts. Kabalye Police Training School in Masindi District, Uganda, lost one of its cadets during these storms on 21 July 2016. Cadet Moris Orach was on his way from the dining hall to his home when a lightning bolt struck and killed him. Colleagues remembered him as a “committed person” after the tragic loss. Unfortunately, lightning fatalities in Africa are not an uncommon occurrence. In 2015, Lightning Science & Lightning Protection: Some Selected Topics found Uganda had the most lightning fatalities in a developing country. According to the publication, Uganda suffers from approximately 70 lightning strikes per kilometer every year, resulting in a loss of over one hundred people each year. A majority of those fatally struck by lightning in Uganda are schoolchildren. Strong thunderstorms dumped heavy rains and 20,000 lightning strikes in Kenya on 7 May 2016. The storm caused numerous deaths, injuries and damage to the southern Kenya region. The Kenya Meteorological Department recorded 104mm of rain in Kabete Nairobi on 7 May. The heavy rainfall, most of which fell in just a few hours, created floods that drowned nine people. Of the nine deceased, three were children in Olwalo village, Kisumu County. Another four people were found deceased in Baringo’s Ilchamus ward. In addition to the loss of life, the floods also displaced 4,000 families in Kenya. The rising river waters shut down the Nakumatt Ukay Supermarket in Westlands, Nairobi (pictured above) and submerged dozens of vehicles (shown below). Another landslide in Murang’a County prompted a search for an elderly woman that was later called off due to dangerous conditions as a result of the continued rainfall. Earth Networks Total Lightning Network captured the storm’s high frequency of both cloud-to-ground and cloud-to-cloud lightning. Lightning kills about 30 people each year in Kenya. Luckily, during the storms on 7 May no one lost their life due to lightning despite how much occurred. Earth Networks sent out seven Dangerous Thunderstorm Alerts in southwestern Kenya and northern Tanzania. 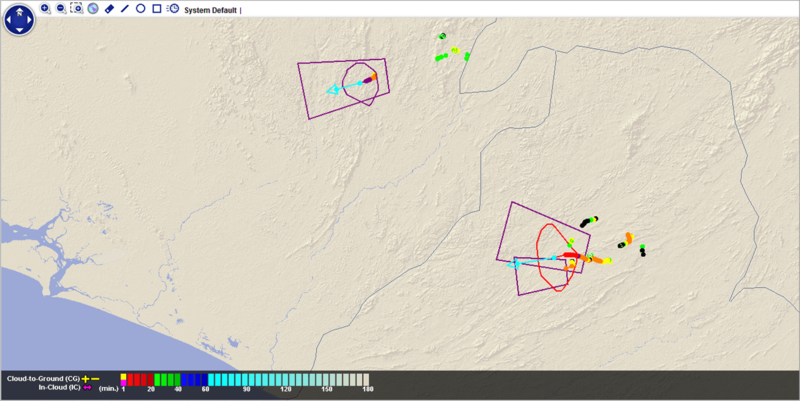 DTAs (represented by the purple polygons in the image below) are generated by tracking total lightning and are designed to warn people of impending severe weather so that they have time to prepare. In order to avoid being struck by lightning, Kenyan officials urge citizens not to carry umbrellas, not to lie on the ground and to stay away from metal bleachers, trees and any other conductors. Intense storms in Turkana County caused floods that killed three and displaced over 1,000 on 10 March 2016. The storm cells brought heavy rains that overflowed the Turkwel and Kawalase Rivers, resulting in heavy damage in the villages of Napetet, Soweto, Kalifonia and Nakerekei. One of the worst affected areas was Lodwar Town, which sits between the two rivers (see map below.) The floods continued until 13 March. Earth Networks Total Lightning Network detected over 500 lightning strikes during the storm that resulted in these floods. Just a few weeks later on 1 April 2016, another flood washed through Kenya due to strong overnight thunderstorms consisting of heavy rain. The Dagoretti Meteorological station in Nairobi recorded 96mm of rain in a 6-hour period. This rain caused the Mgbagathi River to flood, as shown below. The thunderstorms battered the regions of Southern Kenya and Eastern Uganda with over 38,000 lightning strikes in a 12-hour period. The below video powered by Earth Networks Total Lightning Network shows both the cloud-to-ground (yellow) and in-cloud (purple) lightning strikes. Earth networks also sent out a dozen or so Dangerous Thunderstorm Alerts (DTAs) in the region in Eastern Kenya and Western Uganda. 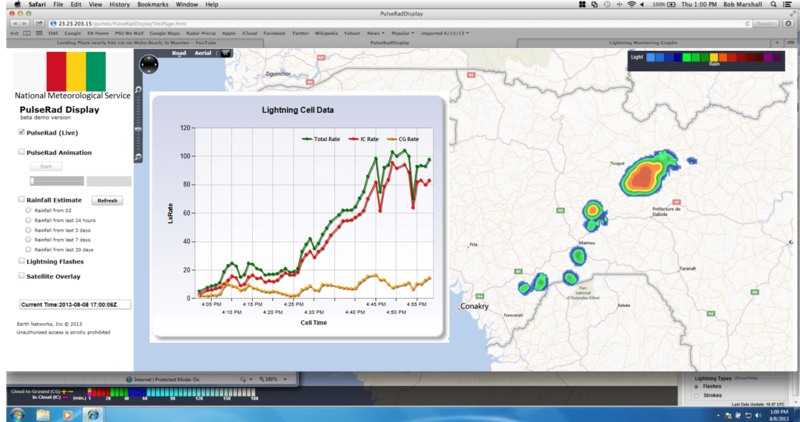 Earth Networks’ DTAs provide the most advanced alerting to severe weather by utilizing our Total Lightning Network. 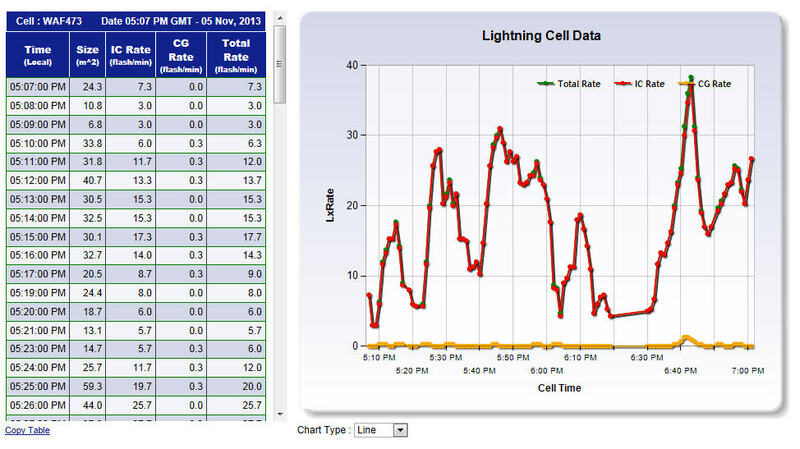 Total Lightning detection makes it possible to deliver DTAs 50% faster, on average, than other alerts for potential dangerous conditions, including high rain totals like the 96mm that flooded the capital of Nairobi in this case. Heavy rains and flooding on 29 April 2016 caused landslides and took the lives of 14 Nairobi people according to the Kenyan Police. The below video powered by Earth Networks Total Lightning Network shows the severity of the storm with over 35,000 lightning strikes in a 12-hour period leading up to deaths in Eastern Kenya. The high frequency of purple in-cloud lightning strikes detected is vital for helping predict and prepare for monsoons and other heavy rainfall situations like this one. A building collapse was responsible for 10 of the reported deaths attributed to the stormy weather. The Kenyan Red Cross rescued 121 people by Saturday morning but it was unclear how many additional people were trapped in the ruble. Rescuers found a woman alive six days after the building collapsed and eventually called off the search on 9 May. The 7-story building shook violently in the rain before collapsing, according to eye-witness accounts. Government officials reported that the building, which was located near the edge of a river, did not have planning permission and the owner of the building was arrested following the collapse. The other four deaths caused by this heavy rain occurred in a similar situation when a wall collapsed. In addition to the lives lost, the flooding negatively affected more than 800 homes. Heavy rains and storms continue to heavily saturate the northern provinces of Mozambique and the damage has been devastating for some. Since the beginning of the current rainy season alone, flooding has affected over 26,000 people while wiping out 1,202 homes and destroying an additional 3,941. The below screenshot from our PulseRad display shows the high rainfall totals for the area for the month of February. As you can see from the key, the regions in red were hit the hardest with the highest rainfall totals ranging from 127-203mm. 27 February 2016: While rain and flooding have been among the largest problems for the people of northern Mozambique, lightning activity is also a concern. A particularly severe storm brought heavy lightning totals to Mozambique in a short period of time. Over 168,000 cloud-to-ground (yellow) and in-cloud (purple) lightning strikes endangered the lives of those in the Mozambique region during this storm. A severe storm system that moved through east South Africa on the night of 25 February 2016 caused substantial damage to the region of KwaZulu-Natal; a region that has unfortunately seen a great number of lightning deaths and injuries over the past few months. During this particular storm, rains and winds were so heavy and intense that they brought schools, churches and homes to the ground. KwaZulu-Natal Co-operative Governance and Traditional Affairs MEC, Nomusa Dube-Ncube, says they have deployed disaster management teams to areas affected the most by the storm. The above photo shows the rising floodwaters in the region. Heavy rains destroyed more than 100 houses in Ntake, to the west of Durban. In Windolene, Marianhill, multiple houses collapsed while occupants were still inside. 12 homes also collapsed due to the moisture and strong winds in Sand River in Ladysmith. The below photo provided by Earth Networks PulseRad shows the high rainfall amounts for the region in just a short time span. This storm also brought over 10,000 dangerous lightning strikes with it, as well. At this time, the death toll due to lightning for this storm alone stands at 5. The below video shows the Total Lightning Detection provided by Earth Networks during the strongest hours of the storm. Both in-cloud and cloud-to-ground lightning (which combine to account for all lightning strikes) were in the mix for this storm. The red box centered on Durban, South Africa outlines the area where all five of the lightning deaths took place as the strongest band of lightning moved northward up the coast. A bolt of lightning struck a tree in an open field while members of the Shembe Nazareth Baptist Church were worshipping on 13 February 2016. The event took place in the KwaZulu-Natal region of South Africa in KwaMachi, near Harding. 38 members sustained minor shock injuries that affected the nerve endings in their hands and feet. 3 members of the church, all women aged 50-65, died as the lightning struck right before the church leader closed the service. The above video shows the Total Lightning activity from the hours of 10-22UTC. Over 13,000 in-cloud (purple) and cloud-to-ground (yellow) lightning strikes affected the area. There was a large break between lightning occurrences in the Harding area around 2:00 UTC. This break in the storm may have lulled the church goers into a false sense of security before an even stronger and more dense grouping of lightning made its way westward through the KwaZulu-Natal region. The above image taken from PulseRad, Earth Networks’ proxy radar, shows that the area around Harding received over 12mm of rain on 13 February. So what happens to lightning once it strikes a tree, like in this incident out of South Africa or like in the below video filmed in Australia? When lightning strikes a tree, the electrical current travels through the wet sap and bark to the ground. Those standing on the ground too close to the tree are at risk of picking up the electrical shock as the energy moves through the tree and the ground. Lightning strikes can result in tree damage ranging from the bark of a tree being blown off to the lightning igniting the tree and it burning to the ground. One man was killed and another 15 injured by lightning strikes in the KwaZulu-Natal province of South Africa on 8 December 2015. A 40 year-old-man was struck and killed about 6 kilometers from Dundee, on the road to Greytown. Lightning strikes throughout the Umzinyati district were responsible for the other 15 injuries. The minutes matter most when individuals are not near safe shelter, like when they are playing a sport, traveling, or near the waterfront. Dangerous Thunderstorm Alerts powered by Earth Networks Total Lightning Network can help protect lives from severe weather by providing the earliest possible notification. Earth Networks lightning sensors detect the most lightning because they look out for cloud-to-ground lightning and in-cloud lightning, which accounts for 80% of all lightning strikes. These warnings often help people reach shelter before cloud-to-ground lightning strikes. Sixteen men were struck by lightning at a soccer match in KwaMaphumula in KwaZulu-Natal, South Africa on 17 November 2015. When the skies began to darken during the match between Bafana Bafana and Angola, a group of spectators huddled for shelter around a TV under a thatch roof. Lightning struck the thatch roof and 16 people underneath it, killing 1 and injuring the other 15. 5 of those injured were in serious condition and the other 10 were treated for minor injuries. The video above shows the lightning storm making its way across the region during the early to late evening hours of 17 November. Earth Networks Total Lightning Network detected a good amount of yellow cloud-to-ground lightning moving through the region. Its quick disappearance over the sea before its quick reappearance on land could have ushered soccer fans into a false sense of safety. Unfortunately, this is not the first time people at a soccer match have been struck by lightning in South Africa. This is an ongoing problem that needs to be addressed in order to save lives. Back in 2011, soccer players fell to the ground as a lightning strike touched down on the field they were playing on. Many players were treated for shock. When the threat of lightning seems imminent, it’s not enough to seek shelter under an overhang, thatch roof, or tree. The best shelter to get to is a building with four walls and a roof. The idea of lightning striking a human can seem very random, however most people that are injured or killed by lightning strikes are struck indirectly. Minutes matter when it comes to seeking shelter during these types of storms, which is why Earth Networks prides itself on being able to alert people up to 9 minutes faster than other radar alternatives when our Total Lightning sensors and weather stations are in place. Heavy rains continue to bear down on the central and southern regions of Malawi from 27 January 2016. The Ministry of Agriculture, Irrigation and Water Development issued a warning to the general public before the rains came, stating that there was a likelihood of flooding in low lying flood prone zones. On 27 January, Earth Networks’ Total Lightning Network detected various storm cells throughout the central region of Malawi over Lake Malawi. The green, yellow, orange, and red circles represent the different storm cells. 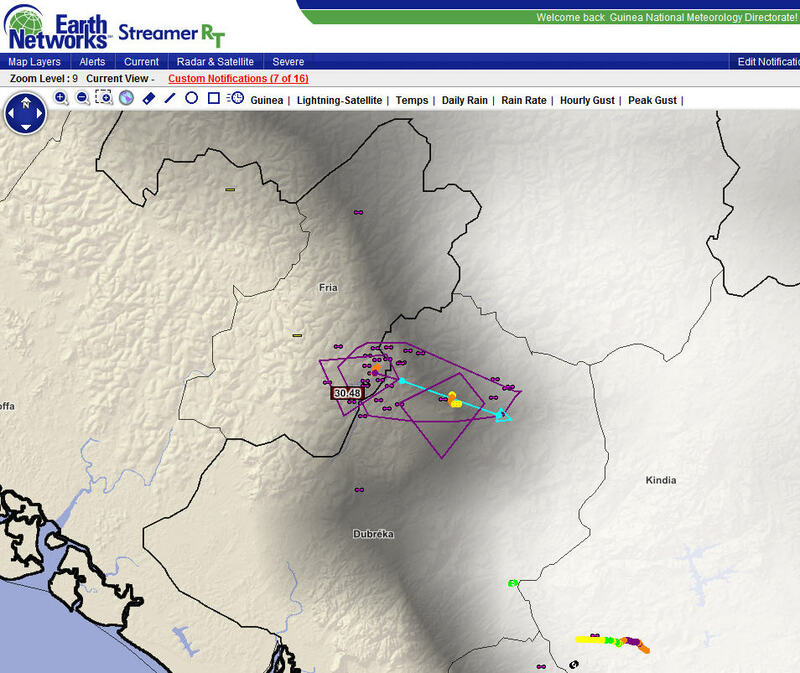 The purple polygons represent Earth Networks’ Dangerous Thunderstorm Alerts. DTA’s provide the most advanced alerting to severe weather by tracking both in-cloud and cloud-to-ground lightning strikes. The epicenter of the activity was near Kasankha Bay. As you can see from the video above, the storm cells moved north to Lake Malawi. Malawi is still trying to recover from the severe flooding they experience near the end of January 2015. The region experience heavy, sustained rainfall from December 2014-January 2015 that caused rivers and lakes to overflow and affected over a quarter of 1 million people. There was even a day during this time period where Malawi received a month’s worth of rain in just one day. Heavy rains and accompanying concentrated lightning activity caused flooding and dangerous weather conditions in the Northern Region. The flooding affected the villages of Mputa, Jeyeka, Malima, Zikome and Mkhwema the worst. 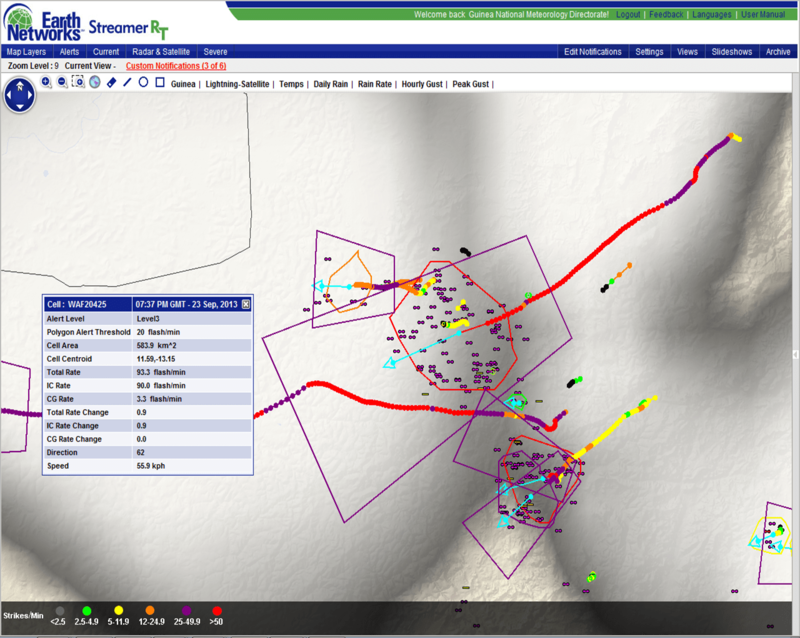 Earth Networks Total Lightning Detection picked up both in-cloud (purple) and cloud-to-ground (yellow) lightning strikes during the 2 day barrage of severe weather events. The heavy rains and hailstorms damaged or destroyed 664 houses in Kasungu District, Central Region. The severe weather also damaged about 1611 hectares of crops including maize, soya, tobacco and beans. High winds and heavy rains swept through Mawali, Africa on 16 November 2015. 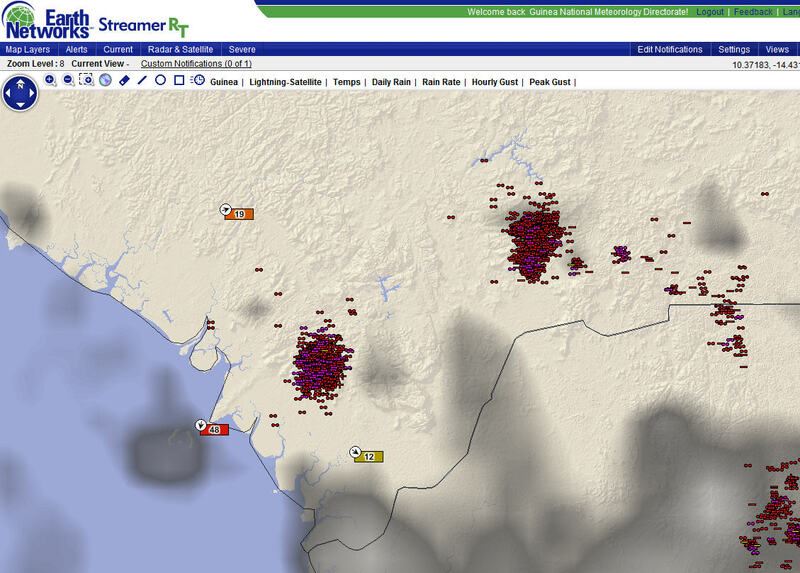 Our Earth Networks weather stations reported that this storm cell was accompanied by high levels of lightning in the area of Blantryre and Limbe. The wind and rain blew roofs off of houses and displaced multiple vehicles. The winds also uprooted trees and sent them crashing into cars and homes. The below video shows a time-lapse of both in-cloud (purple) and cloud-to-ground (yellow) lightning picked up by our ENcast satellite system. As the rain moved north throughout the region it also brought flooding. Flood waters entered many shops and left over 500 people from chiefs Mpherembe, Maulao and Mtwaro homeless. There were no casualties reported. One of these bolts of lightning struck a group of five students, killing one of them instantly and injuring the other four. Throughout the day, the storm grew stronger as it moved westward towards Homa Bay County and Lake Victoria. The image above generated from our ENcast forecasting system shows all of the cloud-to-ground and in-cloud lightning strikes during a six hour period. The importance of not just cloud-to-ground, but total lightning detection is extremely important in cases where cloud-to-ground lightning is sparse. 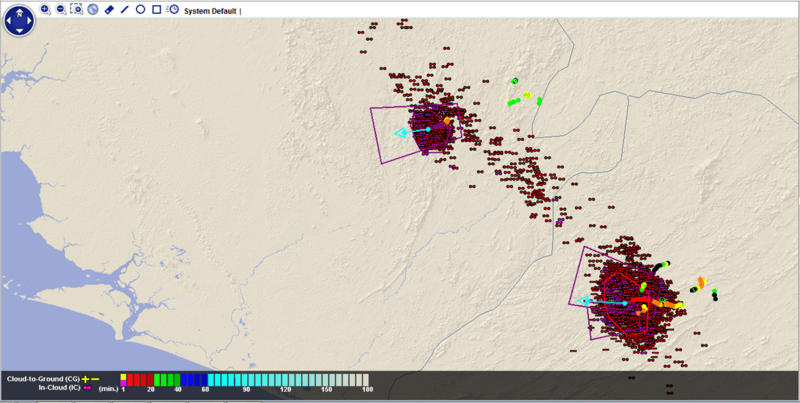 Our Earth Networks Total Lightning Detection was able to pick up a high concentration of in-cloud lightning strikes (purple) making their way towards the village of Ndhiwa, just a half an hour before the deadly strike. As you can see, there are not a lot of cloud-to-ground strikes so many people thought they had time to seek shelter. This image illustrates the strike that we believe to have impacted the lives of those at Magina Girls Secondary School. This strike happened at 3pm local time. An early evening thunderstorm tragically interrupted a funeral procession when a bolt of lightning struck a group of mourners in Mochorwa Village, Kenya on 19 October 2015. Three of those affected by the strike were pronounced dead when they arrived at Kisii Teaching and Referral Hospital. An additional two other people sustained burns to over 48% of their bodies but survived the deadly strike. The above animation is composed of lightning strikes detected by our ENcast cloud-based forecasting tool as well as our Total Lightning Network. The time lapse shows the violent thunderstorm moving northwest through Bomachoge Chache Sub-County. Above is the yellow cloud-to-ground strike that we believe to have hit the group of mourners who were outside during the storm. Many people in the group attempted to find shelter when it began to rain but some were not as lucky. The patches of purple and specks of yellow represent the large amount of total lightning that pelted the area from the hours of 9am UTC to 6pm UTC. 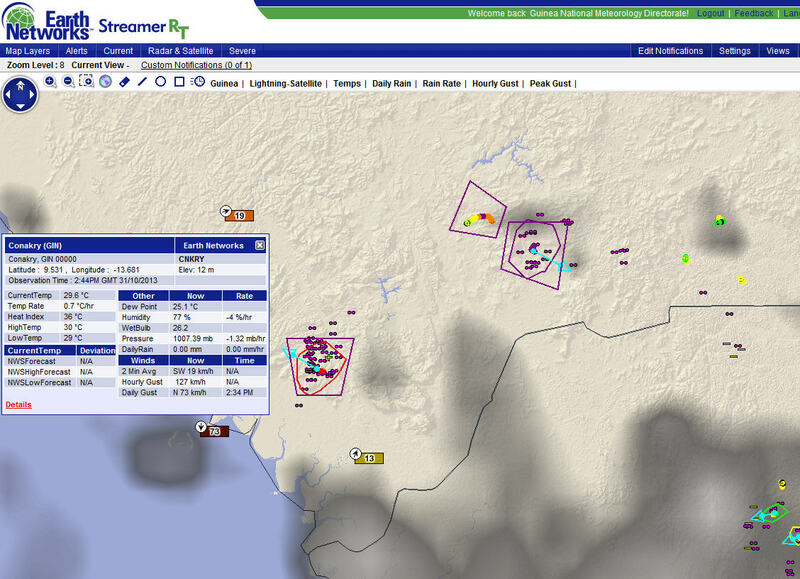 The majority of the lightning strikes in this storm system were in-cloud lightning strikes (purple). In-cloud lightning strikes are often a precursor to dangerous weather events like the fatal strike that ended the lives of three mourners, as well as other severe weather conditions like tornadoes, high winds, and heavy rains. More severe weather and storms like this one are expected to impact the region in the coming months. The arrival of El Niño rains means above average rainfall amounts starting in November. This rainfall will most likely bring landslides and floods along with dangerous lightning. A bolt of lightning disrupted radio transmissions when it struck Multimedia’s radio tower in the Accra area of southern Ghana on 20 October 2015. A storm system moved through the area during Tuesday morning and early afternoon. The lightning strike broke the signal from Multimedia’s flagship radio station Joy FM, as well as three other stations housed in the same building. 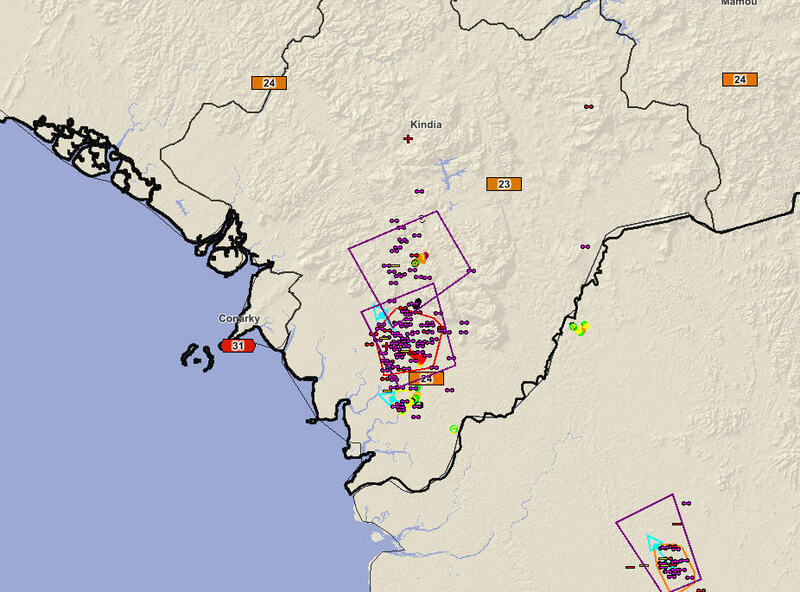 Our ENcast satellite system detected a lightning-dense storm system moving westward down the coast of Ghana. As you can see from the image above, there were high levels of in-cloud (purple) lightning which is often a precursor to cloud-to-ground lightning and other severe weather conditions like heavy rain, flooding, and tornadoes. The dark blue areas pictured above show the stronger parts of the storm cell which had the most rain. Parts of Accra experience extreme flooding throughout the year. Luckily this storm only lasted as little as a half hour in some areas so there wasn’t any severe flooding damage. The above image shows the strike that we believe hit the radio station, as well as other pulses in the area around 10:30am UTC. We were honored to host 28 senior delegates from sub-Saharan Africa today in our office headquarters. This opportunity was made possible by the U.S. Trade and Development Agency, who designed a detailed training program – 2015 Sub-Saharan Africa Climate Information and Early Warning Training Program for this esteemed group. The Training Program was designed to introduce delegates from across sub-Saharan Africa to U.S. products and services for climate information and high-impact weather early warning systems, while providing advanced skills training and familiarization with the latest meteorological technologies and industry best practices. The Training Program is supporting the adoption of modern technology funded under the United Nations Development Program (UNDP) Global Environment Facility aimed at advancing climate resilient development and adaptation. Participating delegates included individuals from the national hydro meteorological service (NHMS) or equivalent agencies in sub-Saharan Africa. We would like to thank USTDA for giving us a day on this training agenda. We were excited to share with this group of delegates our unique, industry first in-cloud detection, which powers our leading Early Warning System capabilities. Our advanced warning capabilities enable robust, affordable, accurate and reliable severe weather nowcasting and alerting for developing countries. The 2014 – 2015 Lake Victoria Basin project continues to prove its capability in the basin throughout African . A number of automatic weather stations have been deployed in the basin and across Africa to provide complete end – to – end advance severe weather alerting to many regions for the first time. Earth Networks collaboration with the East African Community Secretariat, EAC member states and the African Center for Lightning and Electromagnetics (ACLE.org) provides severe weather early warning possibilities through the use of integrated weather monitoring and alerting tools like StreamerRT. Local meteorological services and governments have the ability to see severe weather before, during and after its development. 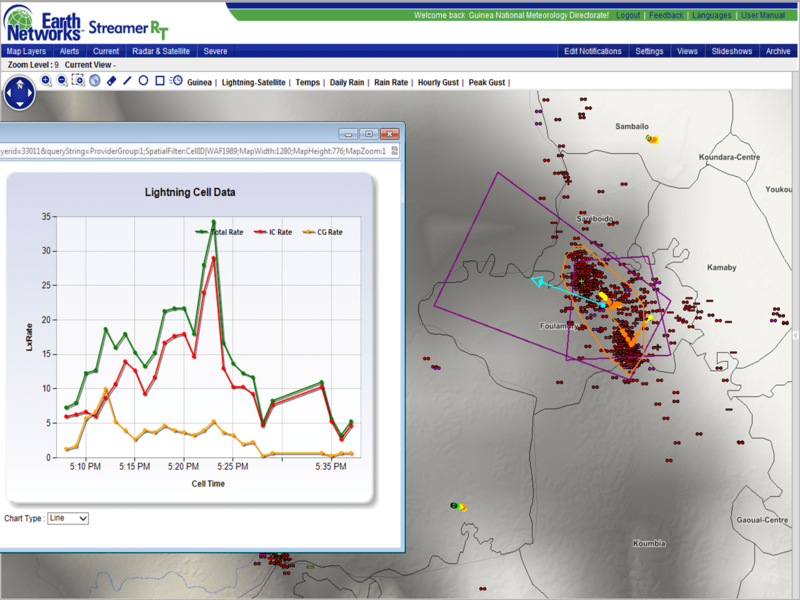 StreamerRT allows the instant visualization of storm cell tracking, dangerous thunderstorm alerting and lightning detection both in cloud and cloud – to ground. 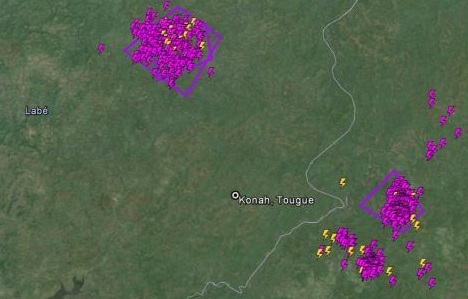 19 June 2014 Guinea News has reported that a severe storm cell has caused 13 lightning-related injuries in Konah, a sub prefecture of Tougue. The storm began Thursday afternoon around 1200UTC with In-Cloud lightning to the East. The first Earth Networks Dangerous Thunderstorm Alert was issued in the area at 1300 and severe storm activity continued to roll through in waves until 1600. 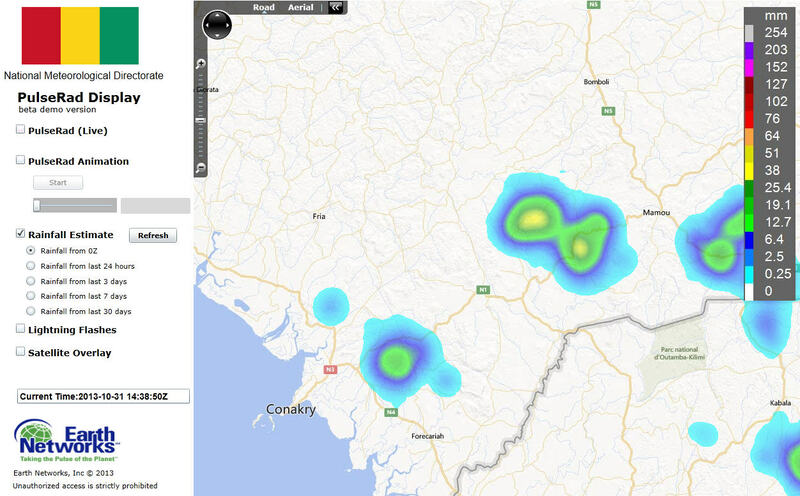 At approximately 1530, Konah experienced heavy In-Cloud and Cloud-Ground lightning strikes. CG strikes in a crowded market area reportedly caused 13 people to fall into a coma. Shortly after being treated for shock and minor burns, three people remained in critical condition. All patients were released from the hospital the following day. There were no fatalities during the storm. Few structures in the area were damaged, and around 40 phones were fried due to electrical charges during the storm. 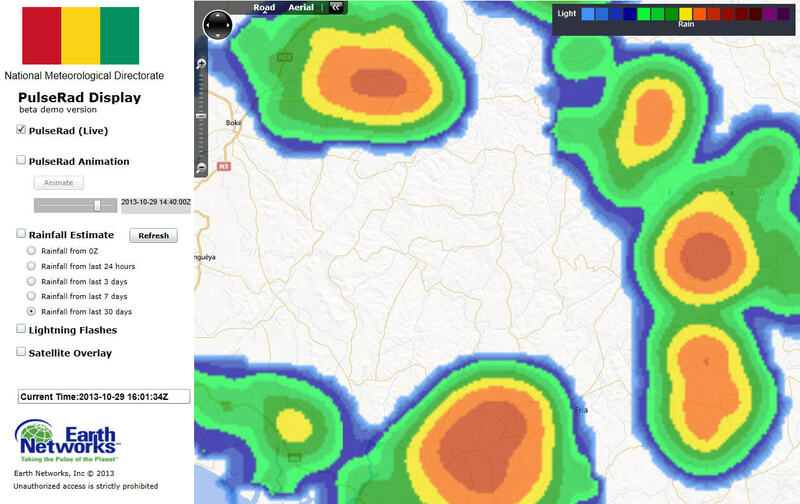 17 June 2014, 1800 UTC: Slow moving, strong thunderstorms developed late this afternoon over the high terrain of Fouta-Djalon. These storms were detected and tracked by the Guinea Total Lightning Network and the simulated PulseRad radar. The slow moving storms contained torrential rains and gusty winds. The Guinea Meteorological Department issued Dangerous Thunderstorm Alerts for these storms due to the frequent lightning measured and the potential for flash flooding rains and gusty winds. 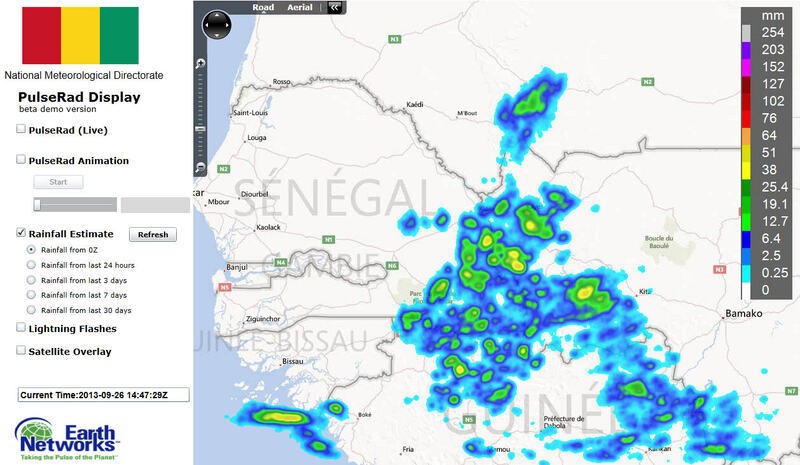 PulseRad radar detected a storm mid-way between Mali and Fria that had dropped over 100 mm of rainfall in less than two hours. It is possible that some locations saw rainfall rates over 100 mm/hour. The storms were heading steadily westward at just 30-35 km/hour and would affect Mali and the central Boke region by 7-8 pm. The city of Boke may not see storms till as late as 10pm but these storms may stay north of the city and keep that region dry. 20 May 2014, 1800 UTC: An upper level area of instability along the Intra-tropical Convergence Zone (ITCZ) moved across the western coast of Africa today, triggering an active and strong area of thunderstorms early in the afternoon. The PulseRad system displays the very strong storms early in the afternoon as they moved into eastern Sierra Leone and over northern Liberia. The infrared satellite image from 18:00 UTC shows an impulse of energy along the ITCZ in western Africa. The storms were tracked by the Guinea Total Lighting Network as they developed and increased in intensity. 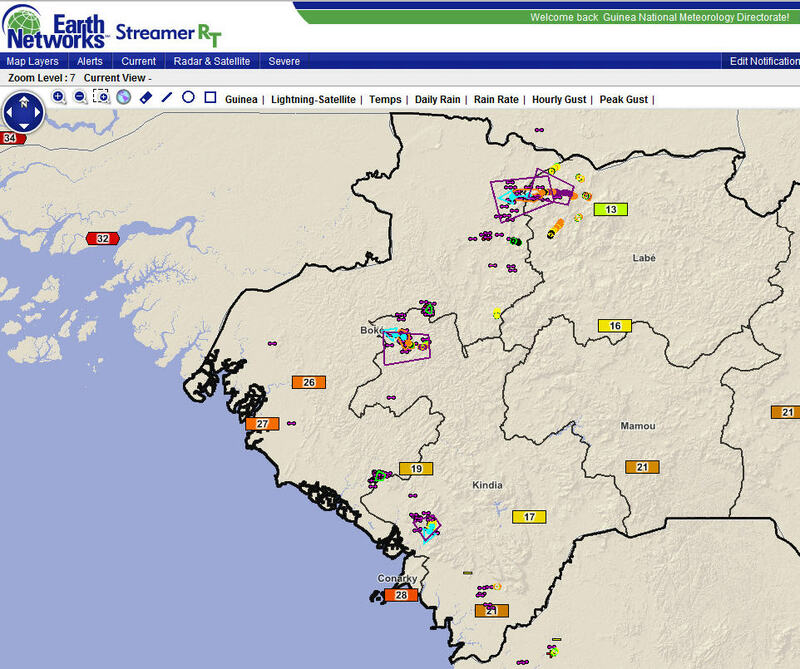 The alerting system, triggered by the intense rate of lightning detected, issued warnings for parts of interior Sierra Leone for storms producing very heavy frequent lightning (rates over 40 flashes/min) and intense downpours of rain. 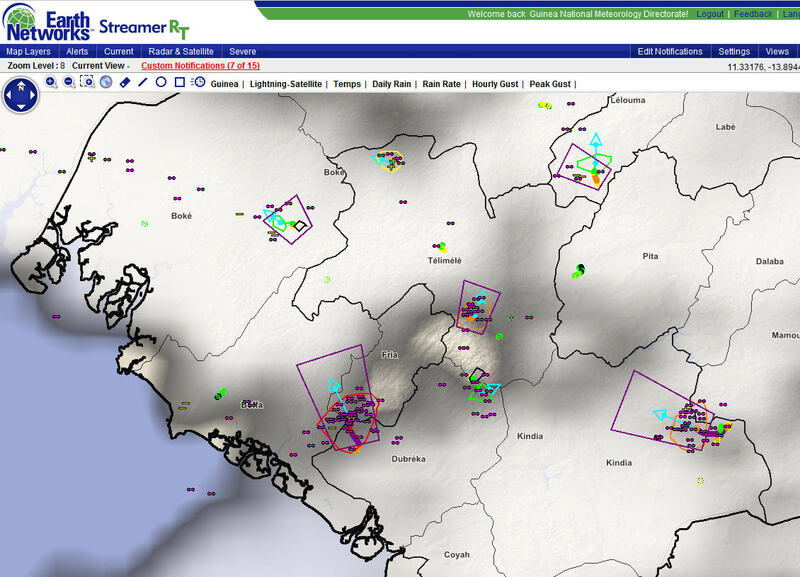 The Total Lightning Network generate Dangerous Thunderstorm Alerts over Sierra Leone due to the very frequent lightning detected by the system. 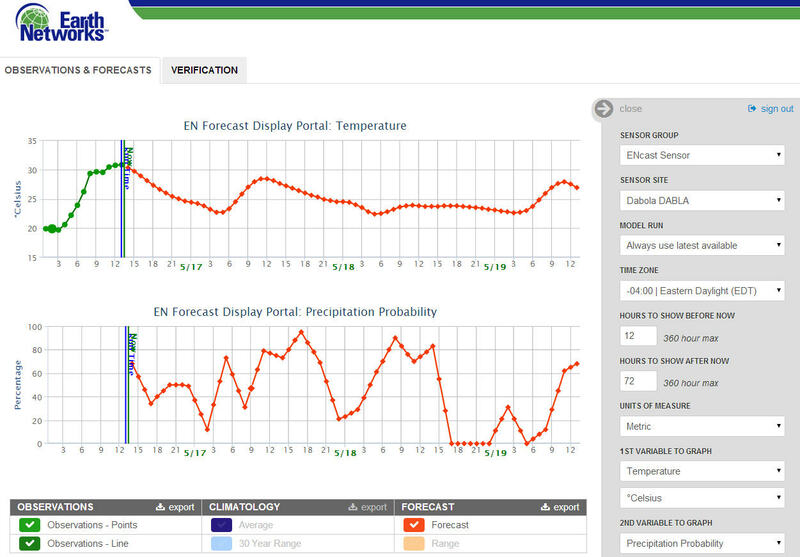 The storms had been well forecasted by the ENcast forecast system. Probabilities for thunderstorms and rainfall were over 50% yesterday and increased to near 100% by late morning today. The ENcast forecast for Monrovia in Liberia indicated very high threats for storms today and over the next several days. 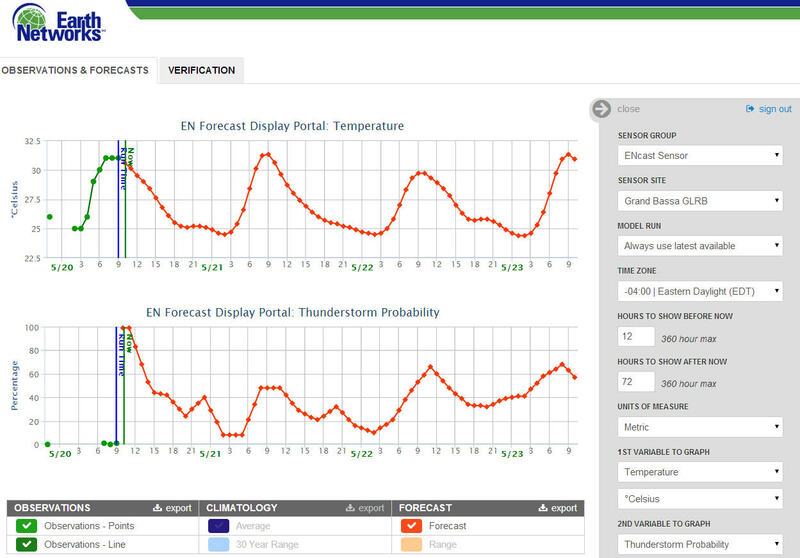 The ENcast forecast engine shows the forecast for temperature and thunderstorm probabilities over the next three days. Very high probabilities for thunderstorms were in the forecast during the afternoon. 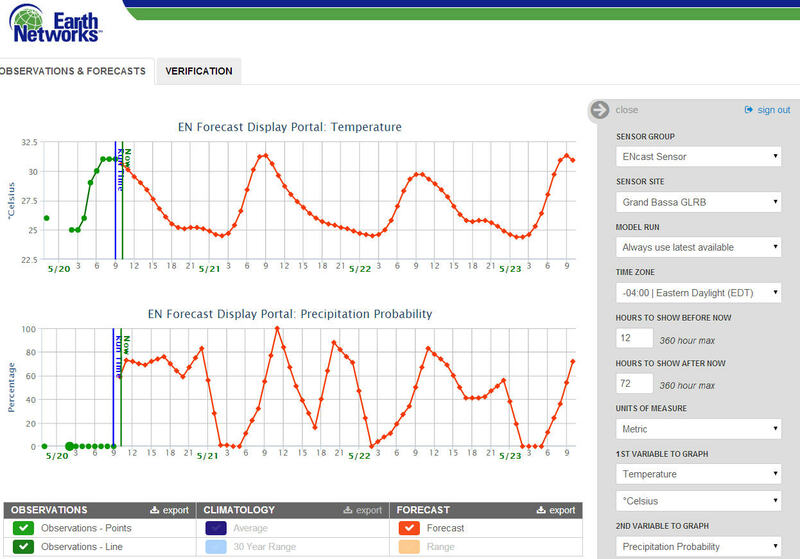 The ENcast forecast engine shows the forecast for temperature and thunderstorm probabilities over the next three days. Very high probabilities for rainfall were in the forecast during the afternoon. 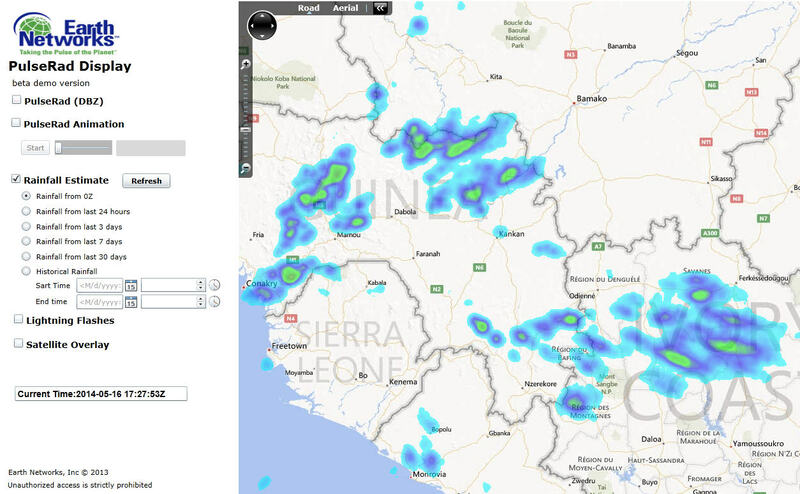 By late afternoon and early evening, the storms had moved to the coast and started to develop in southwest Guinea, but the PulseRad radar system tracking accumulate rain was indicating the storms had dropped significant amounts of rain, specifically in Sierra Leone where 25-50mm of rain was common. 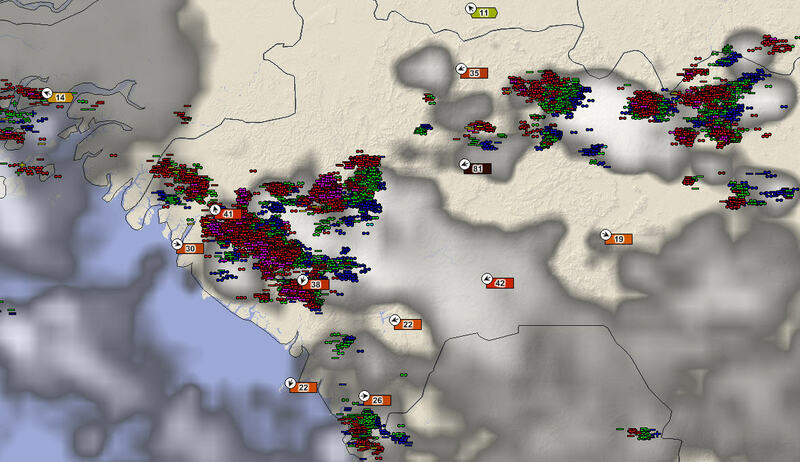 PulseRad shows the strongest storms with the most intense lightning have moved offshore from Sierra Leone by 18:00 UTC. PulseRad estimated rainfall for the afternoon indicates rainfall totals ranged between 15 and 50 mm of rain over most of Sierra Leone and northern Liberia. 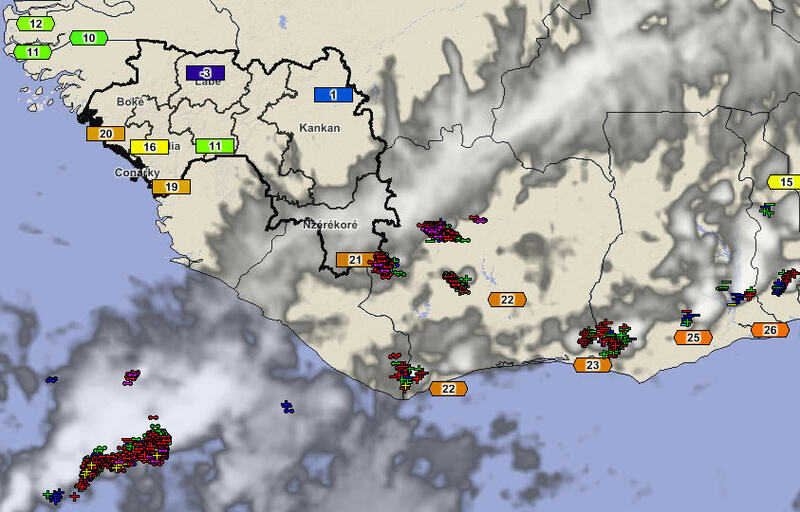 19 May 2014, 1730 UTC: A steady sea breeze caused thunderstorms to build across eastern Guinea this afternoon bringing rumbles of thunder to much of the region. The storms developed along the hills northeast of the coast near Forecariah, Fria and Boke. PulseRad detects a very strong thunderstorm near Forecariah. The heaviest storms formed north and east of Boke and near Forecariah. The Total Lightning Network shows the very intense storms north of Forecariah. Lightning rates exceeded 50 flashes per minute. The storms were very slow moving, dropping between 25 and 50 mm of rainfall over their lifespan. The heaviest rainfall estimated by PulseRad was a very strong storm near Forecariah. 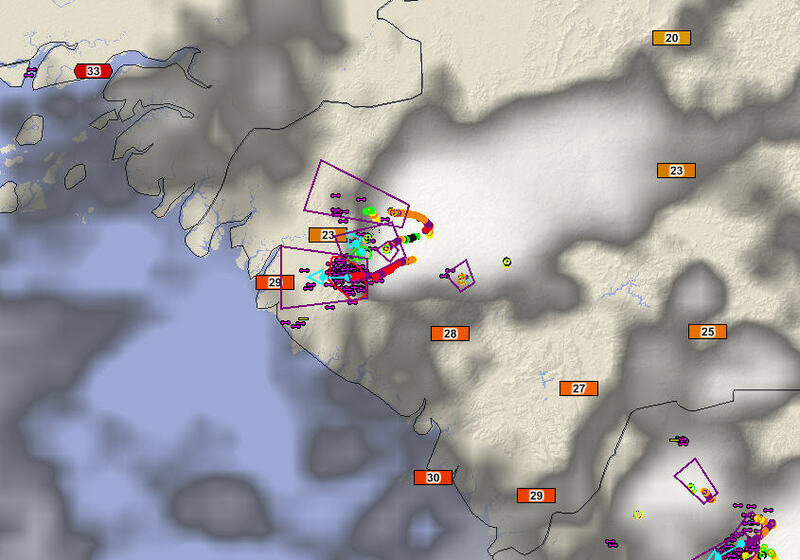 Lightning rates exceeded 50 flashes per minute, as detected by the Guinea Total Lighting Network, for nearly 30 minutes as the storm drifted slowly NW toward Conakry. Rainfall estimates topped out over 100mm just north of the city. Rainfall estimates from the PulseRad simulated radar show rainfall accumulations caused by the sea breeze storms. Rainfall estimates on PulseRad show the typical sea breeze rainfall accumulations – storms develop from 30 to 80 km from the coast and rarely drift to the coast, dropping most of the rainfall on the hills that are inland from the coastal plain. The very strong thunderstorm generated Dangerous Thunderstorm Alerts warning for frequent lightning and flood producing rains. 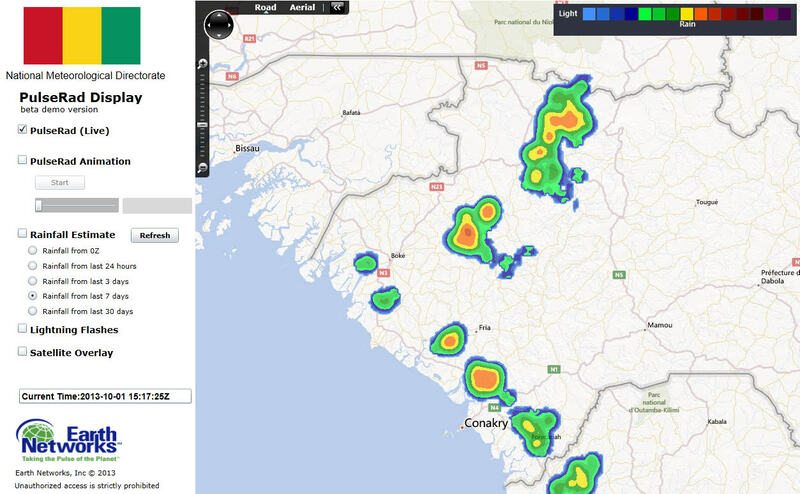 This image shows the storm weakening as it moved toward Conakry. 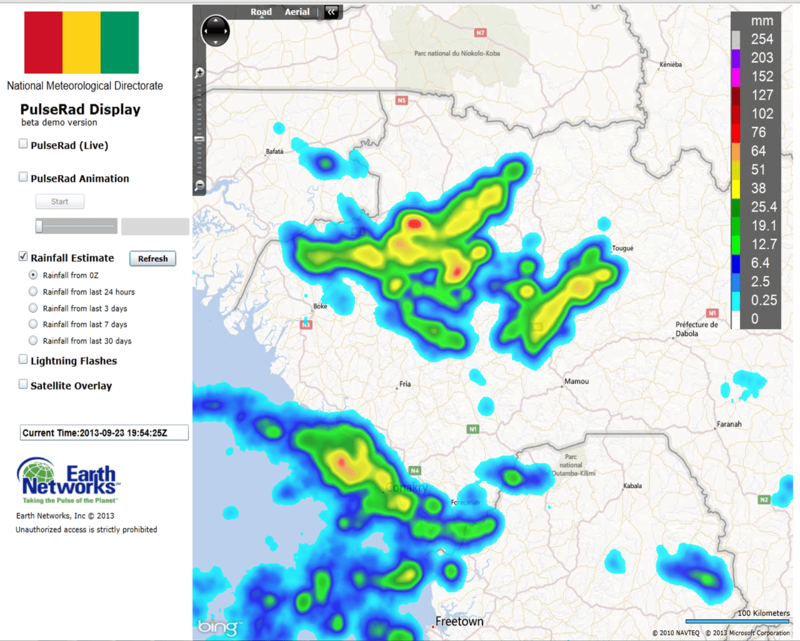 16 May 2014, 1530 UTC: Slow moving, heavy thunderstorms over the Ivory Coast today have been dumping rainfall of 15 – 30 mm over the northern parts of the country this afternoon. Overnight and early morning thunderstorms over Guinea also dropped similar amounts of rain, but had since mostly diminished; giving way to warm humid conditions over much of the country. Image shows the rainfall that has fallen since midnight as estimated by the PulseRad system using the Total Lightning Detection Network. 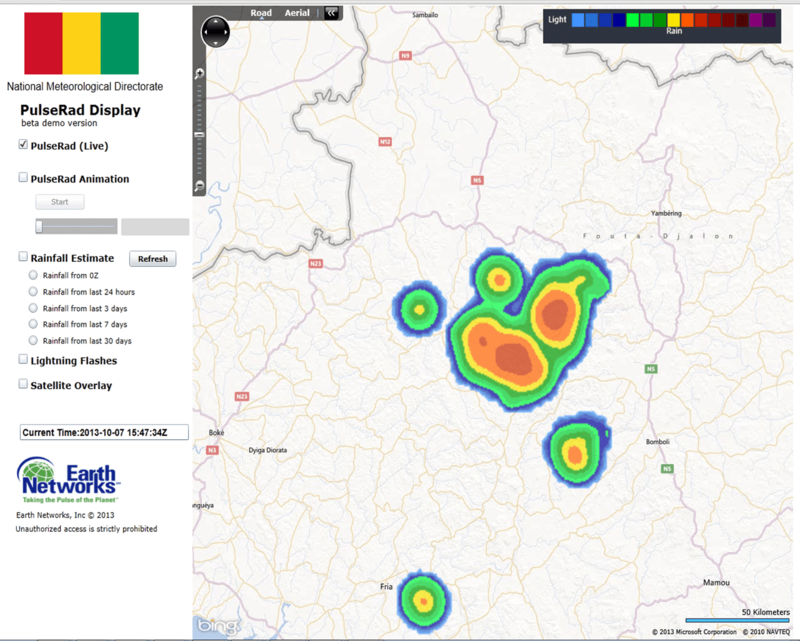 This afternoon, the total lightning detection network was tracking an area of heavy storms in Ivory Coast that would move into southern Guinea tonight. 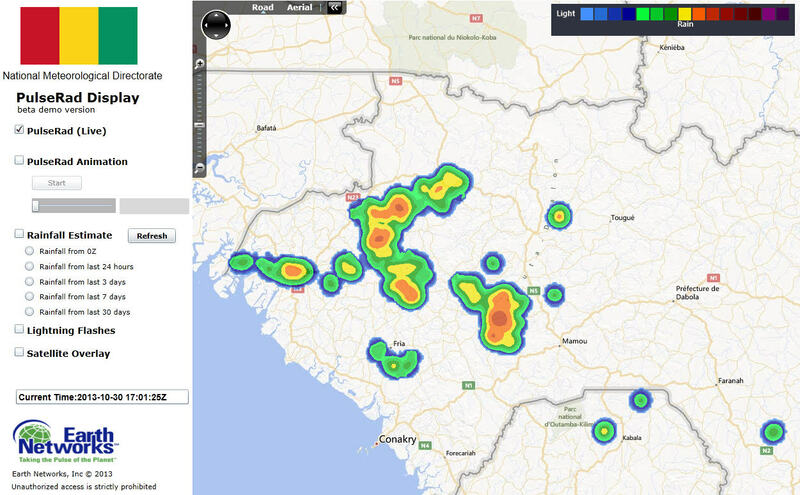 Image shows lightning being detected in strong storms over Ivory Coast. Hot temperatures and limited storm activity elsewhere. This impulse of instability is being tracked by Guinean meteorologists as this area will affect the country over the next two to three days, bringing cooler temperatures and high probablilities for periods of thunderstorms and heavy rainfall. 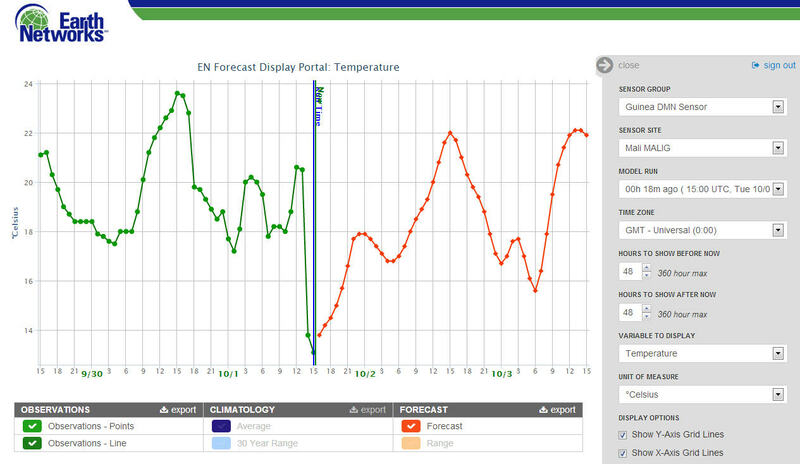 Forecasts generated by the Guinea ENcast Forecast System for both Fria and Debola show the cooling trend of 4-8 degrees occurring over the next few days. 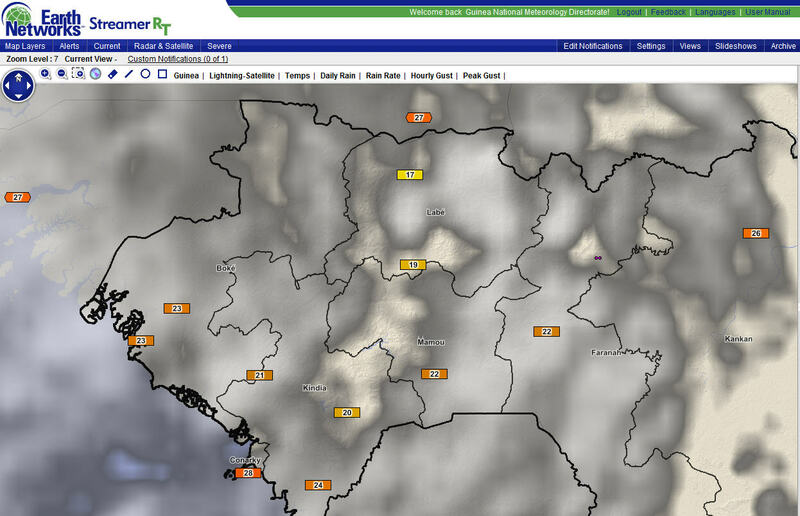 Image shows the hourly temperature and precipitation probability forecast for Fria in Guinea over the next three days. 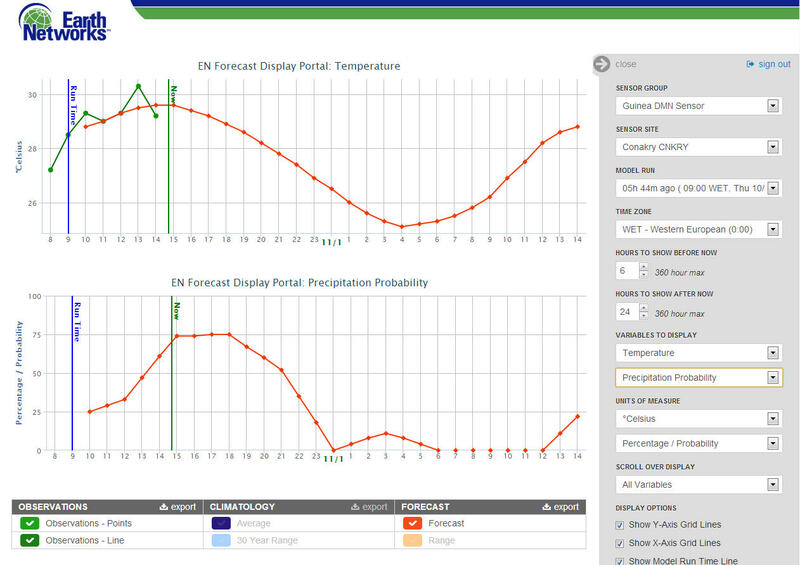 Image shows the hourly temperature and precipitation probability forecast for Dabola in Guinea over the next three days. 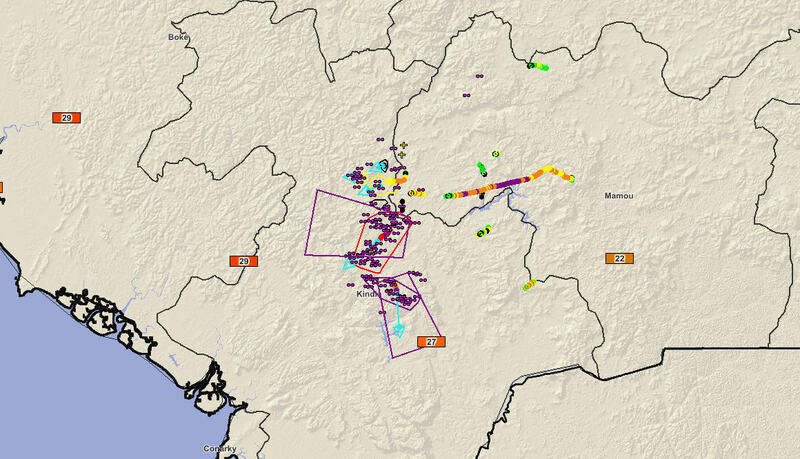 23 April 2014, 18:30 UTC: Meteorologitsts monitored strong thunderstorms which developed on Wednesday afternoon in the Mamou highlands and plodded westward into Kindia by early evening. The Guinea Meteorological Directorate used simulated PulseRad radar powered by the countrie’s total lightning network to track the powerful storms. Simulated radar showed strong storms in the hill country of Kindia producing very heavy rain, frequent lightning and gusty winds. These storms had produced 25 – 50 mm of rainfall across the region in rainfall rates that exceeded 2″/hour at times. Simulated radar allows for rainfall to be estimated based on the frequency of the lightning being detected. PulseRad showed 1-2″ of total rain had fallen in 2-3 hours. The storms with frequent lightning and heavy rain were also likely producing gusty winds as the moved through the hill country of Kindia toward the city of Fria. Also, the lightning intesity that was measured in the storm caused Dangerous Thunderstorm alerts to be issued for two of the more potent areas of storms. Frequent lightning caused Dangerous Thunderstorm Alerts (purple polygons) to be issued for the threatening storms. These storms are forecast to continue to slowly move west over the next several hours but will weaken as they approach the coast. 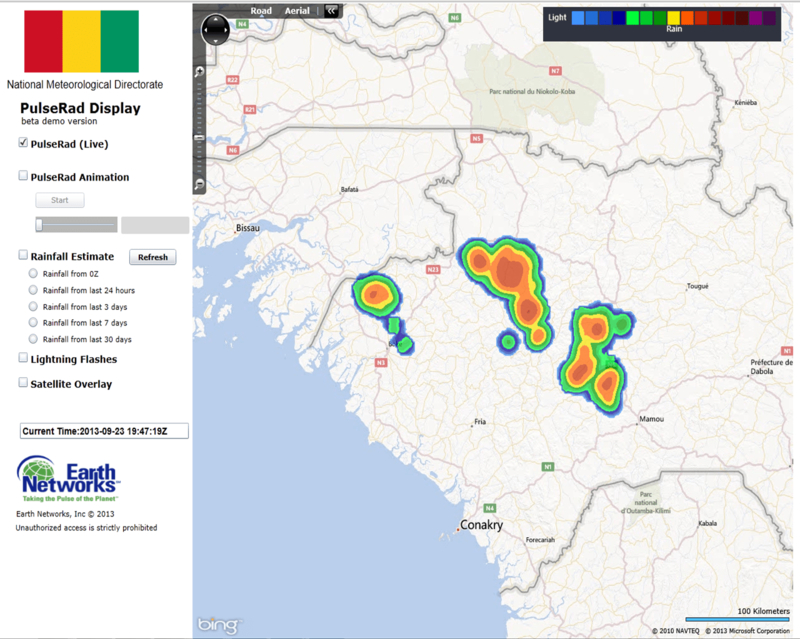 17 April 2014, 20:00 UTC: Strong evening thunderstorms were being tracked by Guinea meteorologists on Tuesday evening as another hot day lead to thunderstorm development. Temperatures had topped out between 31 and 37 Celsius creating instability leading to the storms. 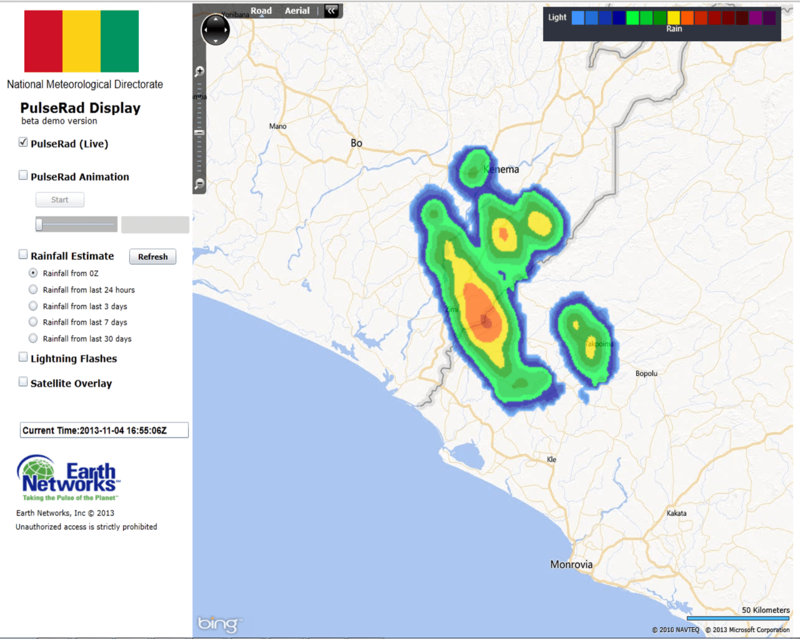 PulseRad simulated radar showed the storms deloping over the highlands of Sierra Leone and Liberia. The Total Lightning Detection Network was also tracking the strongest cells. Lightning rates reached very frequent intensities causing Dangerous thunderstorm alerts to be issued for the worst of the storms. The Total Lightning Network indicated thousands of strikes had occured with the strong storms over just one hour period. Lightning rates in the strongest storms exceeded 30 flashes per minute. 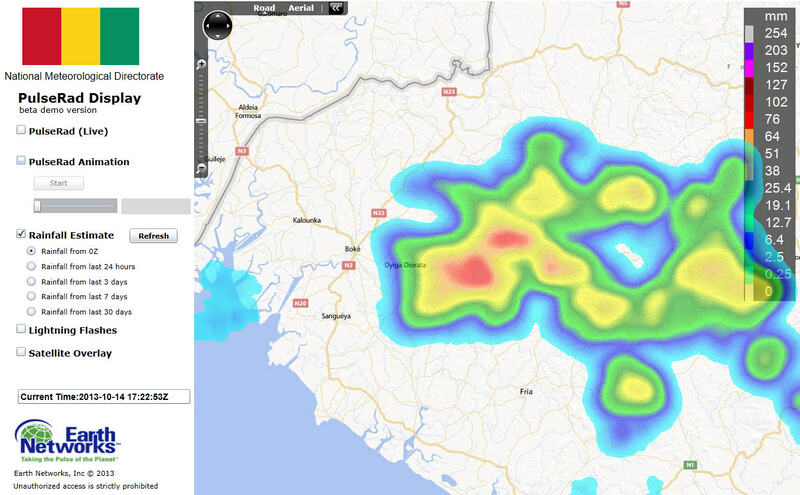 7 April 2014 – 20:00 UTC: Rainy season rainfall continues to be hit and miss across the Guinee Forestiere region in Guinea. Areas of instability that produce rainshowers and storms have been occuring every few days, but most rain over the last month has fallen south of a line from Faranah to Kankan. Total rainfall in the last 7 days in this region has been from 25 mm to as high as 125 mm. Rainfall continues to be limited to the southern region of Guinea. 25 to 125 mm has fallen in the last week. Meteorologists were tracking strong storms today in the region in an area northwest of Nzerekore that had the potential to produce dangerous thunderstorm winds and heavy downpours. 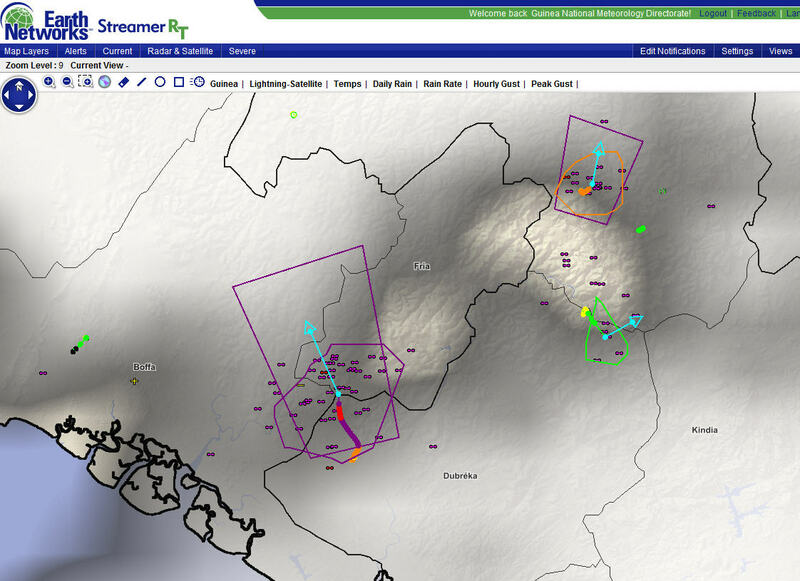 PulseRad simulated radar showed the heaviest storms in the hilly terrain northwest of Nzerekore. Dangerous Thunderstorm Alerts (DTA) issued by the National Meteorological Directorate were triggered by the detection of high rates of lightning being tracked by the Total Lightning Network. Automated polygons are generated by the Total Lightning system to indicate areas that could experience heavy rain, frequent lightning and gusty winds. Earth Networks Total Lightning Network has tracked severe storms today with lightning rates above 30 flashes per minute. 17 March 2014, 1900UTC: For much of the country, Guineans have been shown little sign of a change of seasons. Hot, dry weather continues across much of the region with the flow of hot, dry air massess coming off the inner continent. But meteorologists don’t have to look outside the country for signs that the rainy season is approaching. 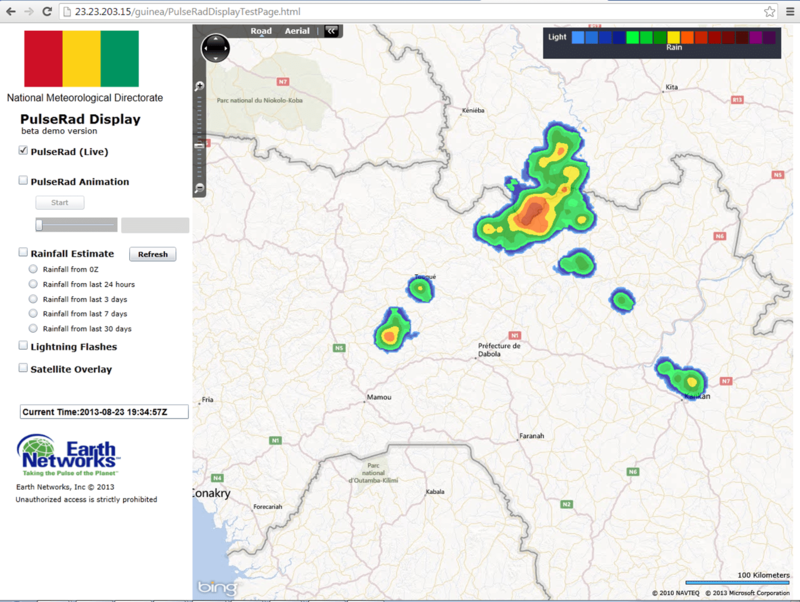 Semi-regular bouts of showers and storms have been evident in Guinee Forestiere over the last couple of weeks. All signs of the pending rainy season that residents expect in the coming month. 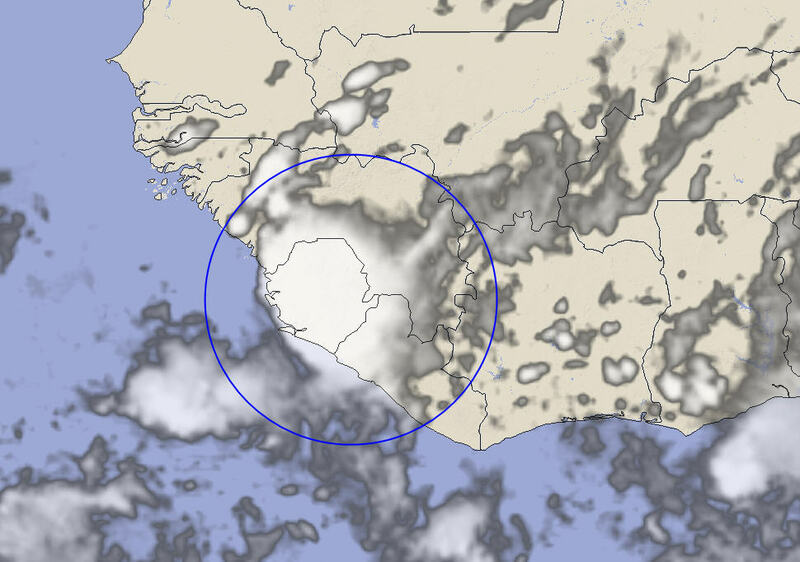 Afternoon clouds and storms are becoming more common in southern Guinea. 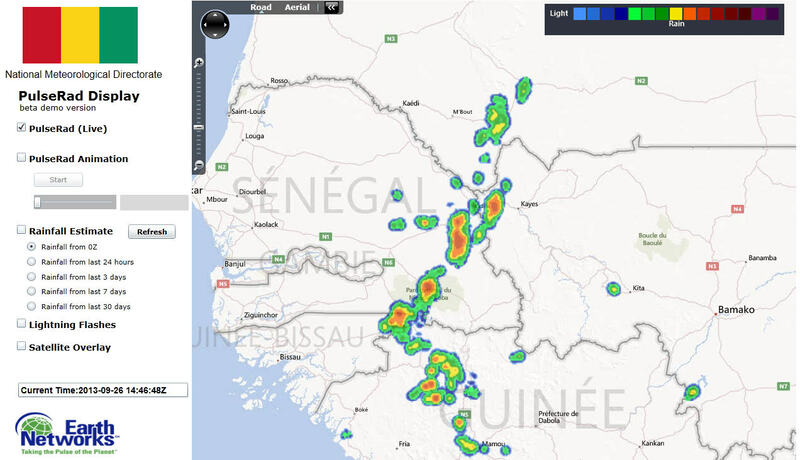 Guinean meteorologists have been tracking the increase of moisture in the southwestern areas of the country using the network of live weather stations, the total lightning detection network and also satellite data. The data shows dew points pushing above 20 degrees in Nzorekore on a regular basis and afternoon showers and storms over the prefecture every 2-3 days. WIth the onset of the rainy season approaching, signs are being seen of it’s beginning is southern Guinea – as dew points have pushed in to the 20s. The rainy season is far from the minds of the rest of the country, only evidence of it’s approach is the closeness of April on the calendar. Northern areas continue to have hot sunshine and very dry air on a regular basis, with only the coastal areas getting into hot, sunny humid weather with winds off the ocean. The dry season is firmly entrenched in the northern portions of Guinea with afternoon and evening humidity below 20% every day. The Guinea Meteorological Deparment is also using its new forecast system to track the weather over the coming weeks. 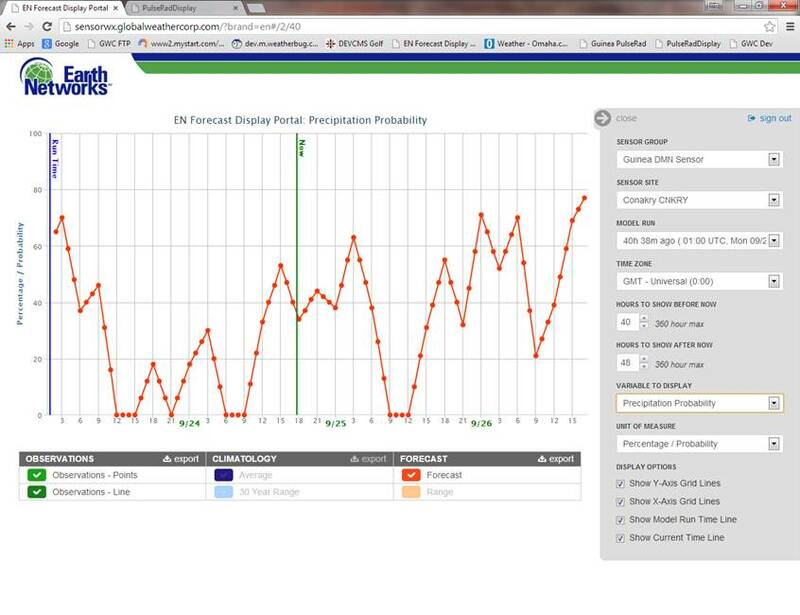 The forecasts show that 4 of the next 5 days show chances of rainfall in Nzorekore with chances increasing each day. Sure signs the rainy season is almost underway in the south, and sure signs that northern residents will begin to see a start to fresh, regular rains in a few weeks. 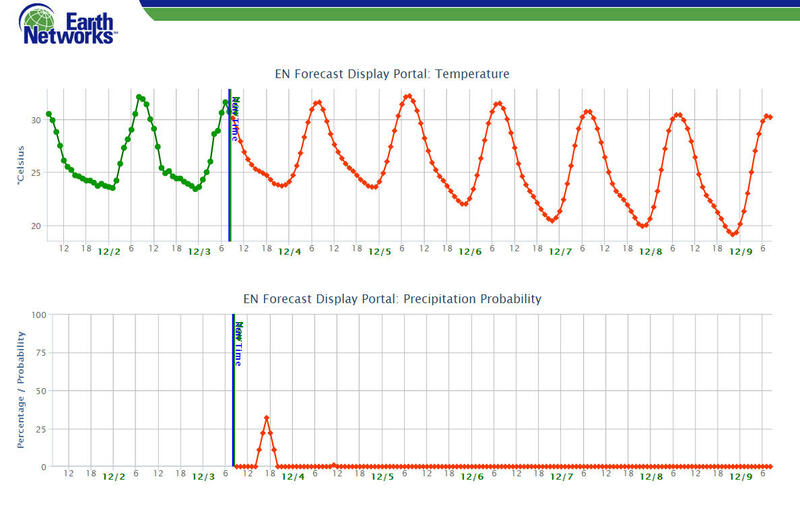 3 December 2013, 13:00 UTC: Guinean meteorologists have been closely monitoring the shift in seasons over the last month as the convergence area that produced the daily rains from June through October has steadily shifted south toward the equator. Rainfall recorded around the country at the live weather station locations has shown a steady drop in measureable rain since Oct. 31. For example, the weather station in Fria has recorded just 3.3 cm of rain in the last 33 days. In October, the location recorded nearly 10 times as much rain – measuring 29.2 cm in 31 days. The Guinea ENcast forecast system shows that the dry season will be well entrenched, with virtually no chances for rain over the next 6 day. Temperatures remain warm with high temperatures reaching 31-33 C nearly every day. Forecasts show the dry season is well underway with warm temperatures and virtually no chances for rain. The Guinea Total Lightning Network has been able to track the movement of the convergence area producing storms well away from the country and out over the shipping lanes leading into the port of Conakry. 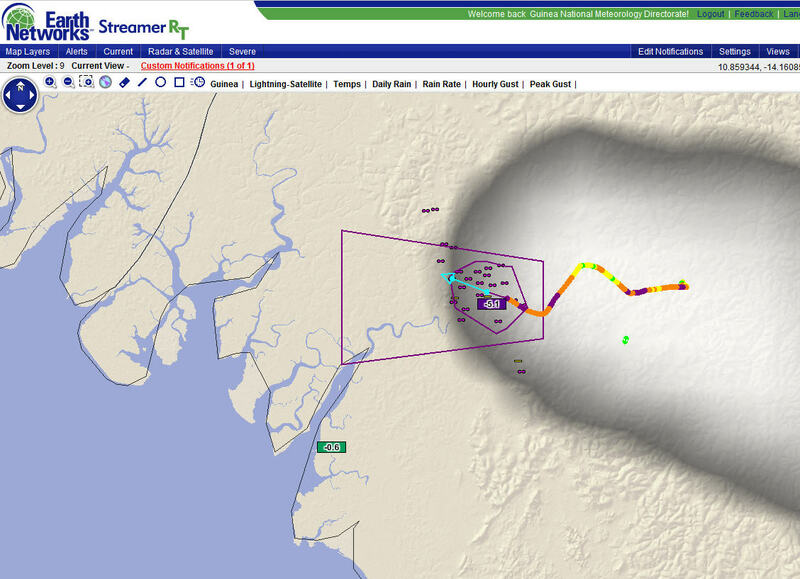 Lightning over a period of 30 minutes is shown in an intense storm detected by the Guinea Total Lightning Detection Network. Today, a very intense storm developed southwest of the city and the network captured the significant lightning that was indicating a strong storm with high winds and intense rainfall. Guinea PulseRad tracked very intense thunderstorms thate developed near the coast and tracked offshore. Lightning rates reached thresholds that caused the automated system to issue Dangerous Thunderstorm Alerts for these areas over the open oceans. 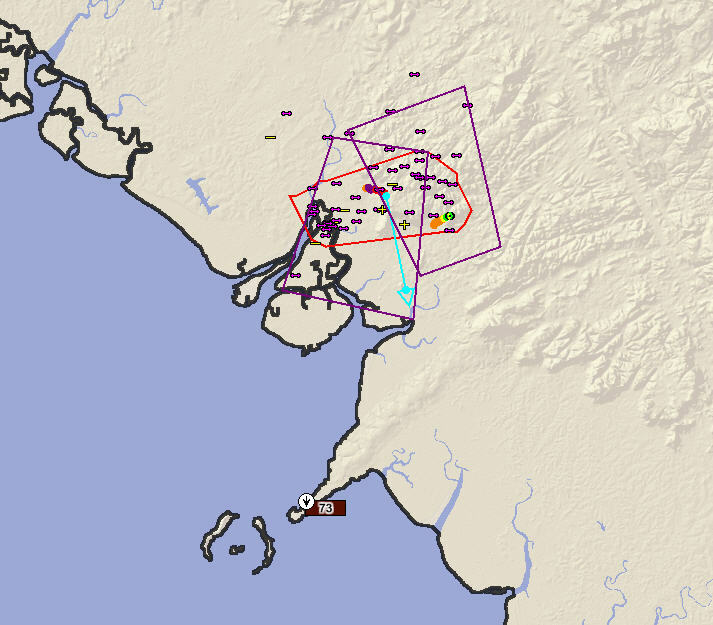 An intense storm detected by the Guinea Total Lightning Detection Network with associated Dangerous Thunderstorm Alerts issued due to the intensity detected. 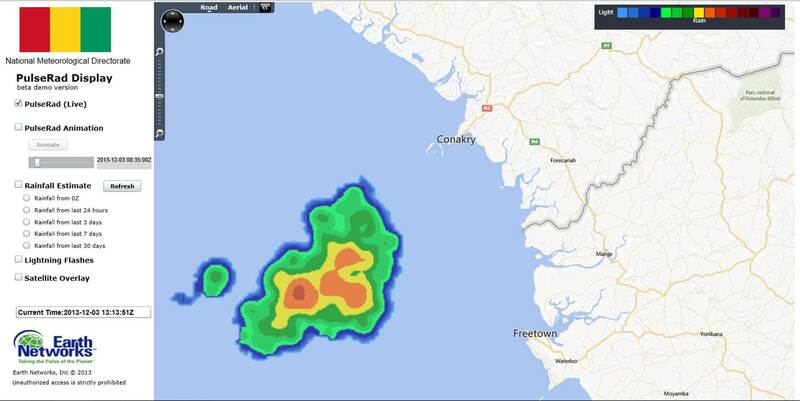 12 November 2013: Late this afternoon and early evening, strong storms have been slowly tracking along a sea breeze front just inland of Conakry and along highways N4 and N3. 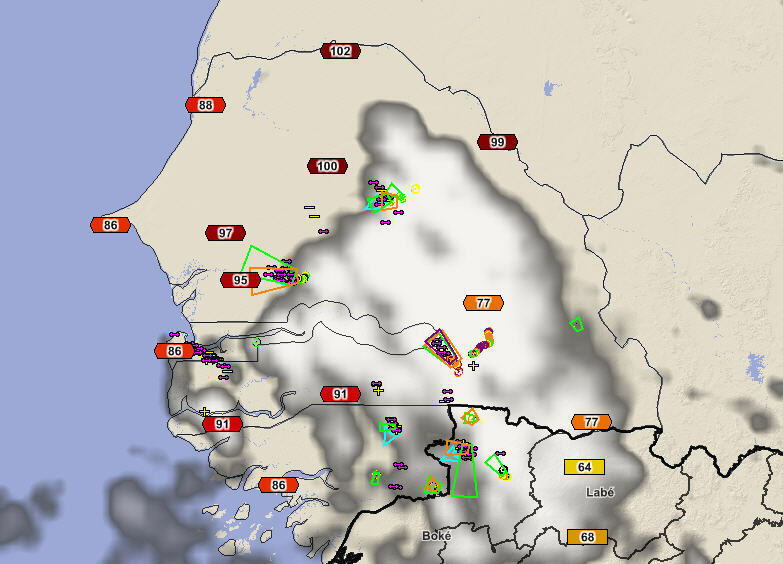 The strongest of the storms was just north of N4 between Forecariah and Conakry this afternoon and tracked northwestward decaying and regenerating into an even stronger storm north of Conakry. 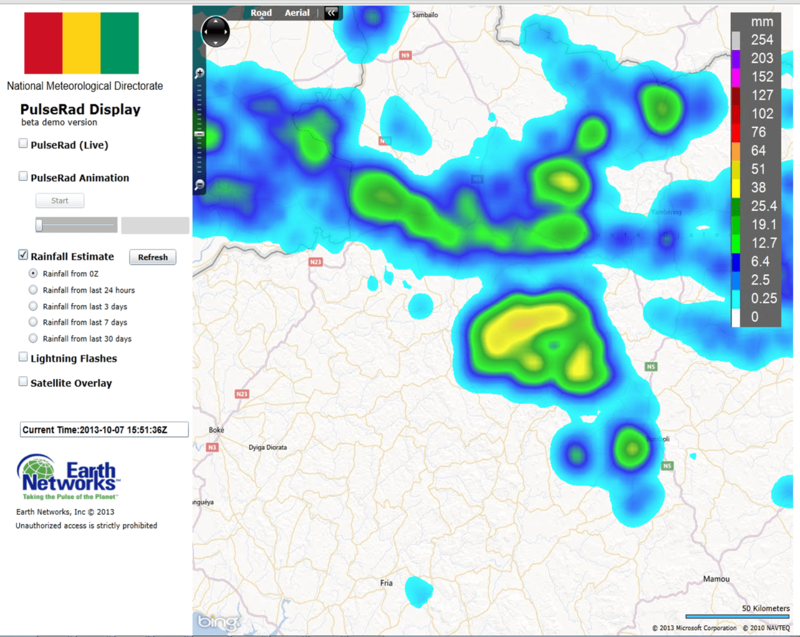 PulseRad simulated Radar shows a very strong thunderstorm north of Conakry. 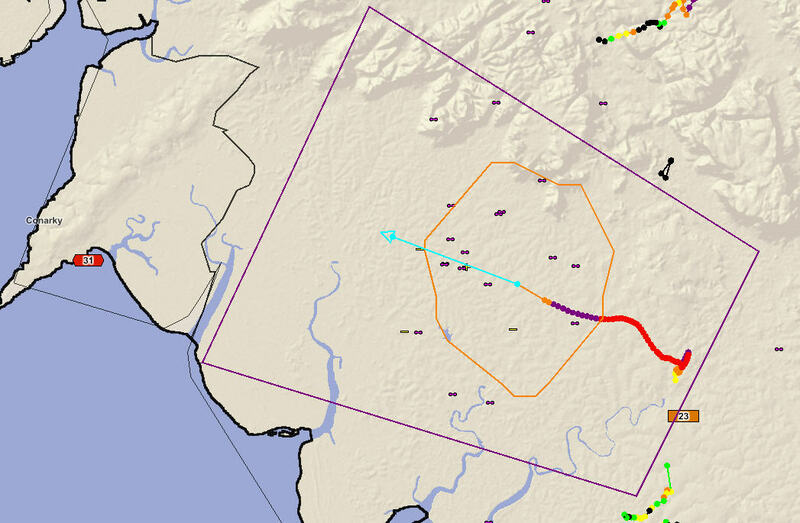 The Guinea Total Lightning Detection System triggered several Dangerous Thunderstorm Alerts (DTAs) to be issued along these highways as this storm drifted norhtwest. 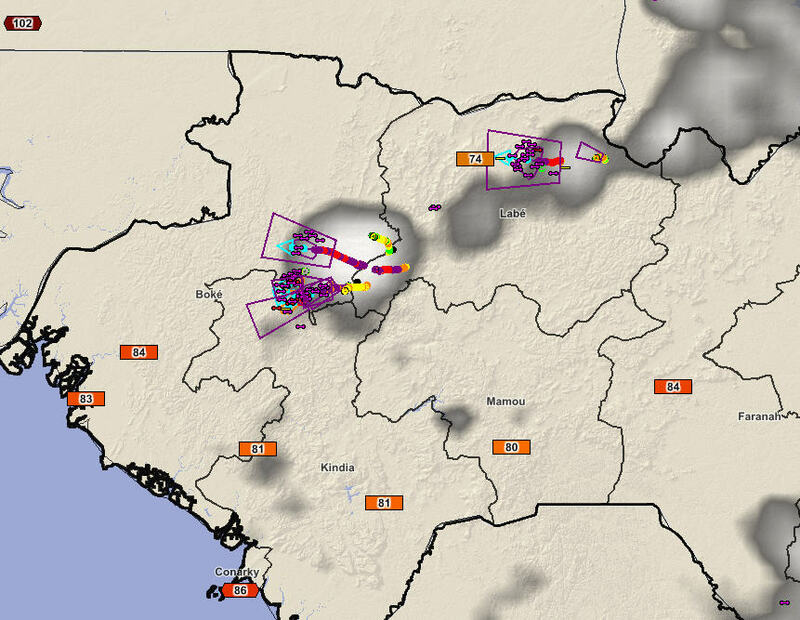 Dangerous Thunderstorm Alerts are shown as strong storms with very frequent lightning rumbled north of Conakry around 4:30 p.m. today. Despite all the activity just 20 km inland, Conakry remained dry for the most part as stable winds off the Atlantic kept the storms just inland. An outflow wind gust from the storm did peak at 73 km/hr as the storm skirted to the northeast. Rainfall estimates by the Guinea PulseRad system were showing rainfall totals of 15-50 mm had fallen in just over an hour in these areas. 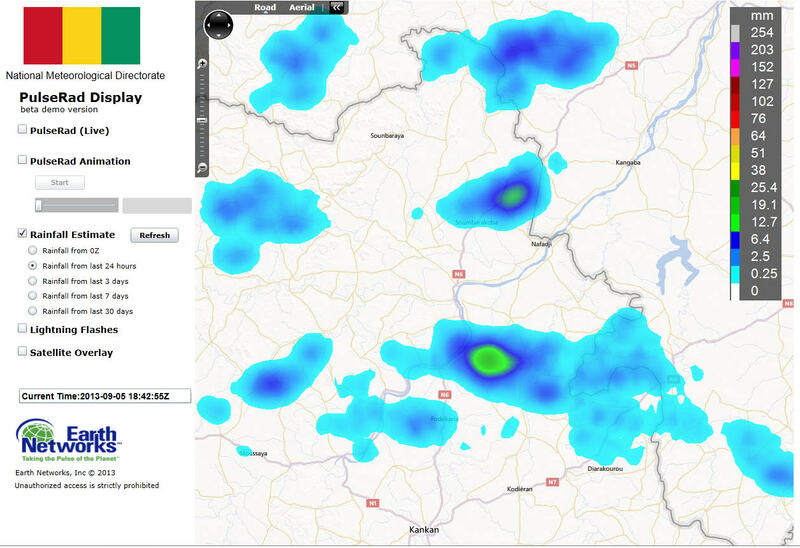 PulseRad precipitation estimates show rainfall largely avoided Conakry although 15-50 mm of rain fell in just 60-90 minutes just 25 km away. 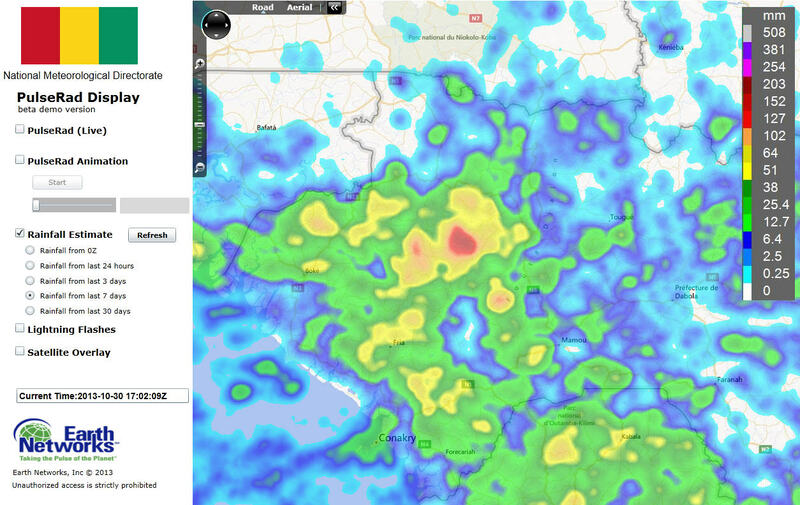 Another strong storm just west of Mamou also had very heavy rainfall occur along N1 just 20 km to the west. 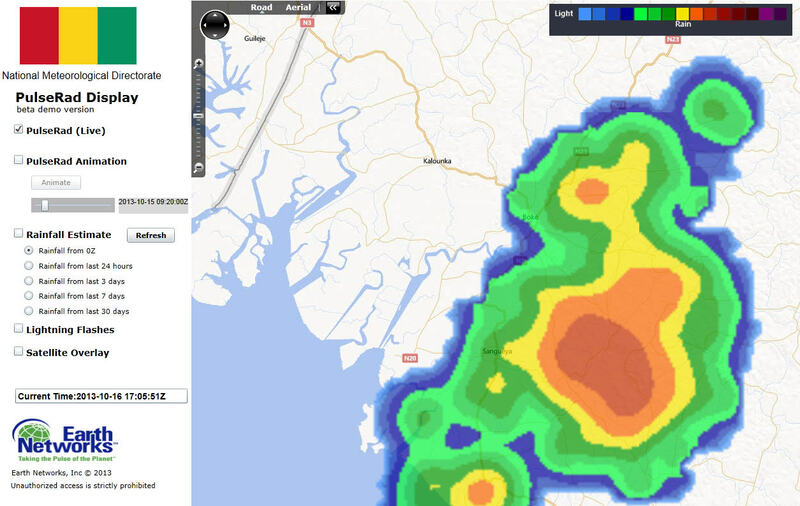 11 November 2013: A very strong thunderstorm developed rapidly just SE of Conakry as the Guinea Total Lightning Detection System caught the rapidly developing, slow moving storm and issued a Dangerous Thunderstorm Alert (DTA) at about 12:30 a.m. The DTA is issued for the intense storm due to the high rate of intracloud (IC) and cloud-to-ground (CG)lightning indicating the storm was capable of high wind gusts, and extremely heavy rain. The video shows multiple DTAs issued for the city as the storm slowly moved toward the city. After 1 a.m., the storm regenerated and new DTAs were issued for the NE portion of the city as well. The slow moving storms allowed for very heavy rain to fall in less than one hour. 5 November 2013, 19:00 UTC: A strong thunderstorm that formed to the east of Boke was tracked by meteorologists as it strengthened into a dangerous storm just east of Boke at about 6:45 p.m. this evening. The storm was detected to have lightning rates exceeding 40 flashes per minute by the Guinea Total Lightning Network. The Total Lightning Detection System issued an automated Dangerous Thunderstorm Alert (DTA – Purple Polygon) for this storm for the likelihood of intense rain, frequent lightning and gusty winds. The DTA gave Boke about 20 minutes lead time before these affects hit. Winds gusted to 71 km/hr as the storm approached with lightning flashing just to the east. When the storm rolled into the city, real-time observing instruments recorded a more that 5 degree C temperature drop in a matter of minutes. Rain rates were intense, producing flash flooding as rain fell at a rate of more than 100 mm/hr. Over 40 mm of rain fell in less than 30 minutes. Rainfall from the storm was also estimated to be between 35 and 50 mm – mostly falling in about 30 minutes. 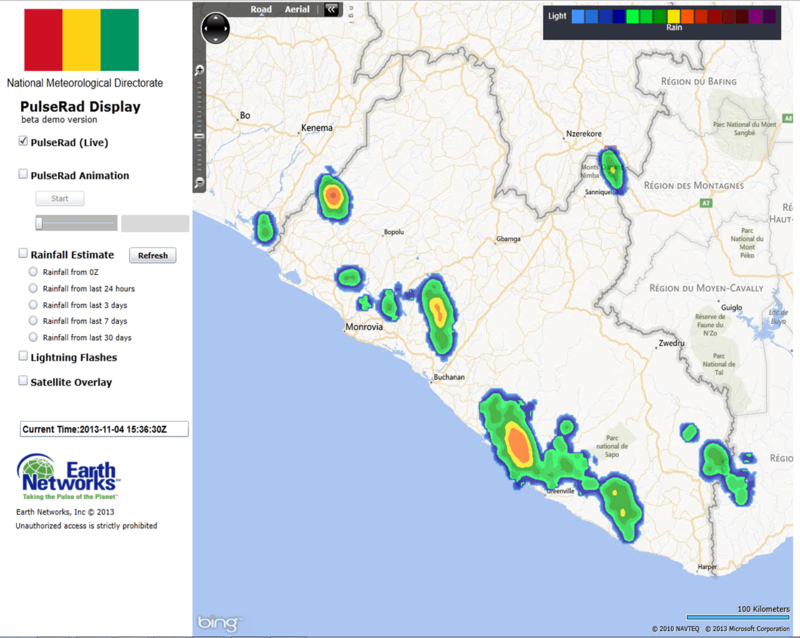 4 November 2013, 20:00 UTC: Afternoon and evening storms were being tracked by Guinea meteorologists as they began forming along a sea breeze convergence zone in Sierra Leone and Liberia. Total lightning detection allowed forecasts to see a fairly extensive line of storms about 20 miles inland from the coast. PulseRad simulated radar showed these storms very well. 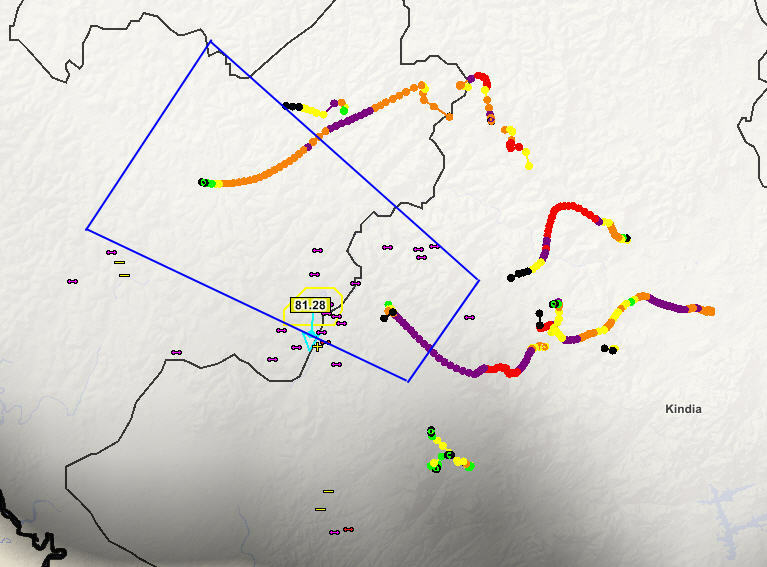 The Guinea Total Lightning Detection Network was showing wide spread lightning occuring with several storms producing frequent lightning at a rate to cause the automated alerting system to produce Dangerous Thunderstorm Alerts (DTAs). 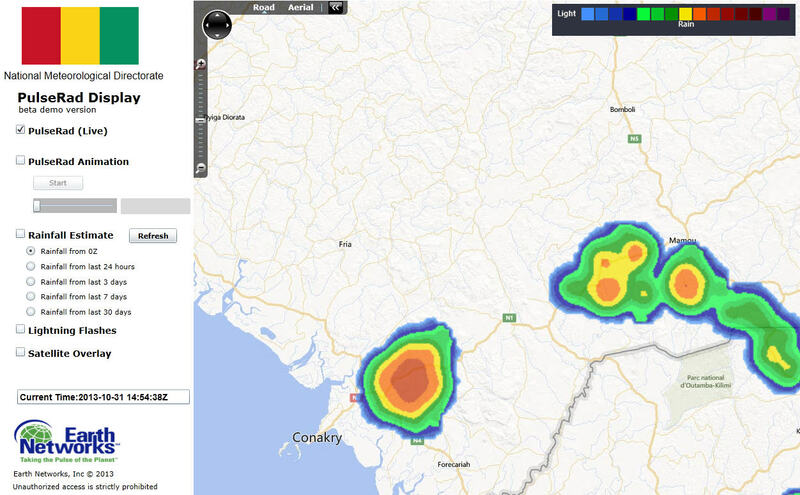 The image below shows the most intense of these storms along the Sierra Leone and Liberia border. The Guinea TLDN detected lightning frequency over 20 flashes per minute and issued a DTA for the storm. This storm was producing heavy rain, gusty winds and very heavy downpours. 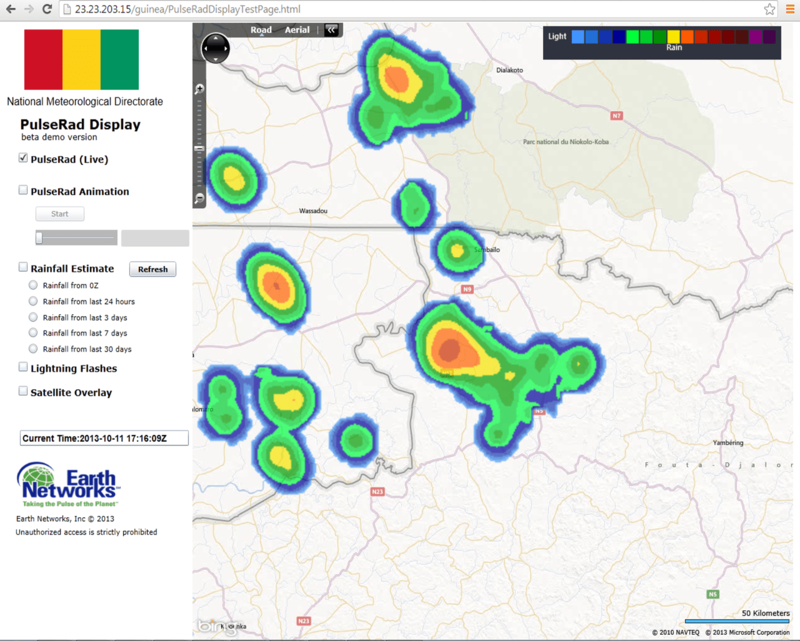 Update – 15:30 UTC: Guiinea meteorologists continue to monitor a strong storm between Conakry and Kindia near the N1 highway. PulseRad radar estimates indicated that 75-100 mm of rain has fallen in the last 60-90 minutes. Recently, winds have gusted to 90 km/hr in Conakry. Flash flooding is occuring in this region. Dangerous Thunderstorm Alerts continue to be in effect for this storm. 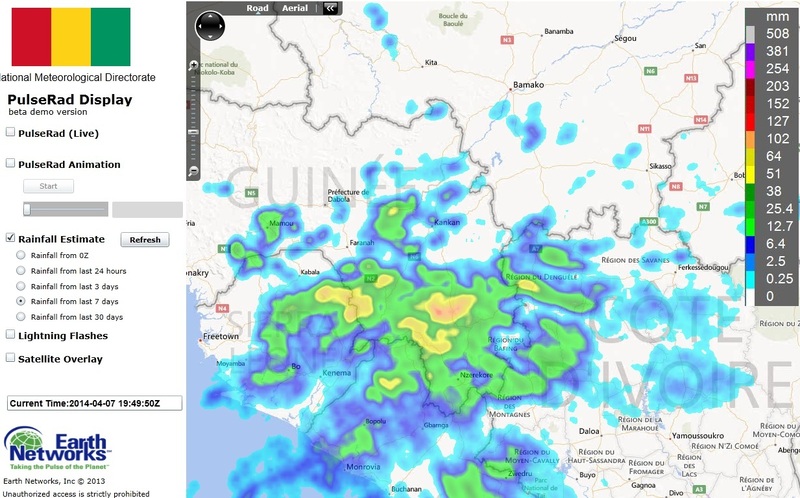 PulseRad precipitation estimates indicate 75-100 mm of rain has fallen since 2 p.m.
31 October 2013, 14:30 UTC: Guinea meteorologists are once again tracking the development of afternoon thunderstorms across Basse Guinea, the western region of the country. Today, storm development has been less due to drier air in the mid-levels across the northern and northwestern part of the country. More significant moisture is evident in the southwest and this is where scattered storms have begun to develop. 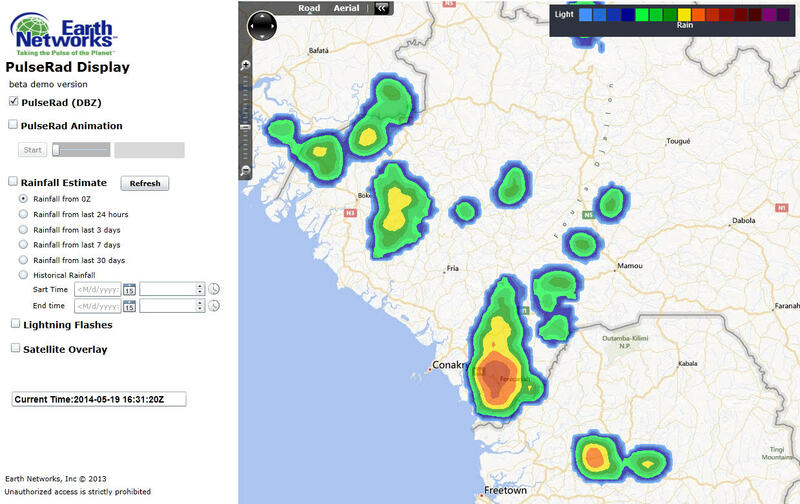 Strong storms have formed in the hills to the northeast of Conakry and near Kindia and Mamou. 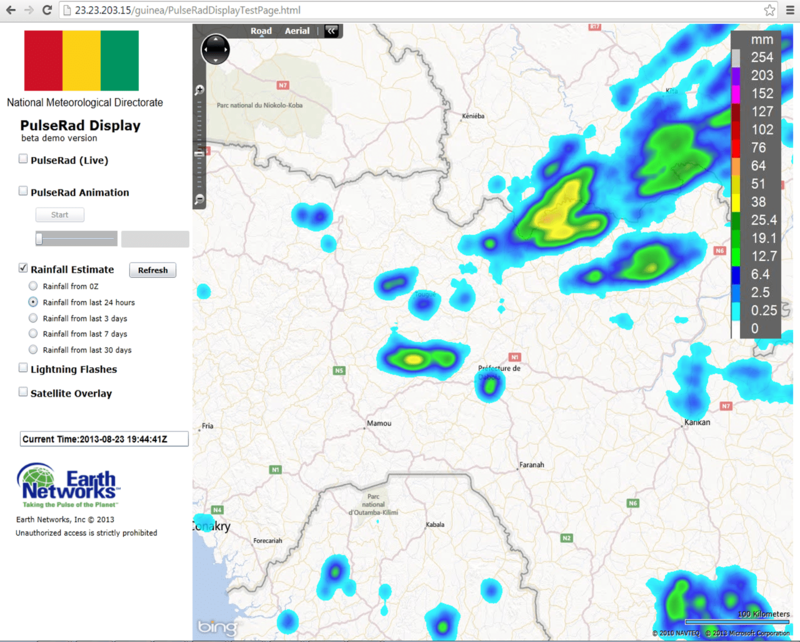 Very intense storms have developed betwen Conakry and Mamou. 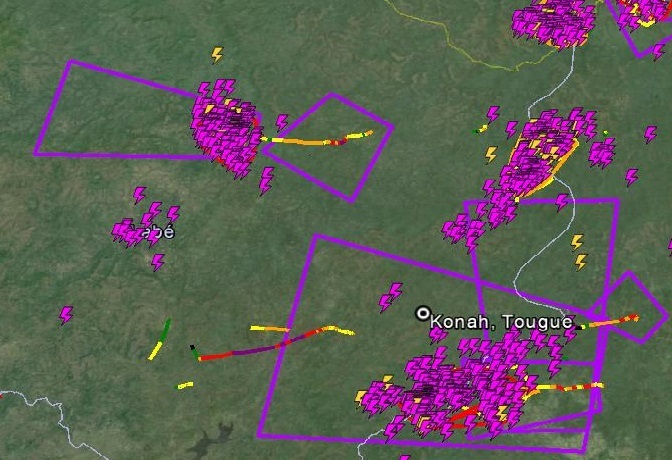 The Guinea Total Lightning Detection System has tracked the development of two very strong storms along the N1 highway running between Conakry and Mamou. The system has generated Dangerous Thunderstorm Alerts for these storms for dangerous lightning, very heavy rain and gusty winds. 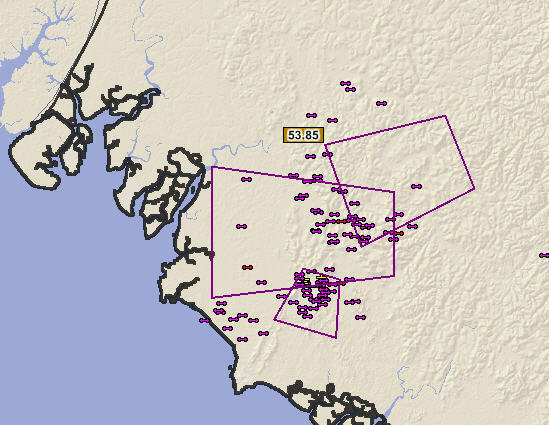 Very frequent lightning has triggered the issuance of Dangerous Thunderstorm Alerts (purple polygons) in this region. PulseRad, simulated radar generated from precipitation rate estimates base on the total lightning detection was showing some extreme rainfall rates. The storms were moving very slow and rainfall totals in the last 30-60 minutes have been locally heavy from 25 – 40 mm/hr. Rainfall in just an hour has exceeded 50 mm in a few locations due to the slow movement of the storms. 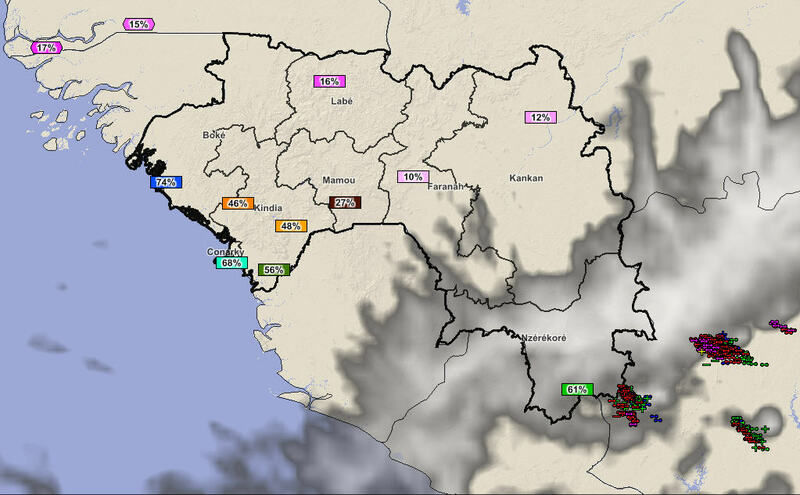 Just after 2:30 p.m. local time in Conakry a strong outflow wind gust was observed in the city – gusting to 73 km/hr. Live observations in Conakry show that the storm to the northeast caused a wind gust across the city that reached 73 km/hr. Hourly updating forecasts using the live station data indicate that precipitation probabilities will be high through the afternoon due to the slow moving nature of the storms. Due to the slow movement and copious moisture in the region, forecasts indicate high probability for storms until after sunset. 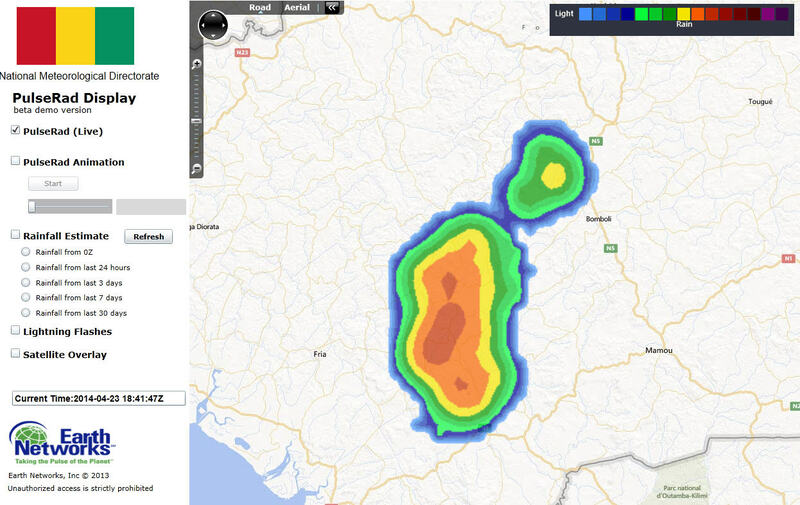 30 October 2013, 17:00 UTC: Meteorologists at the Guinea Meteorological Directorate have been monitoring another round of afternoon storms developing over the hills and highlands of Basse Guinea. As has been an almost daily occurance that a watch can be set by, storms have formed over the higher terrain where continental easterlies converage with Atlantic sea breezes. Converging winds (blue line) along with day time heating over higher elevations have created daily instability to cause thunderstorm development. These locations have seen a daily parade of storms that meteorologists have monitored each day for potential severity. Each day, a number of storms have developed into potentially severe storms based on total lightning data detected by the Earth Networks Total Lightning Network. Dangerous thunderstorm alerts have been issued for the storms that show a slow drift toward the west and the coast. 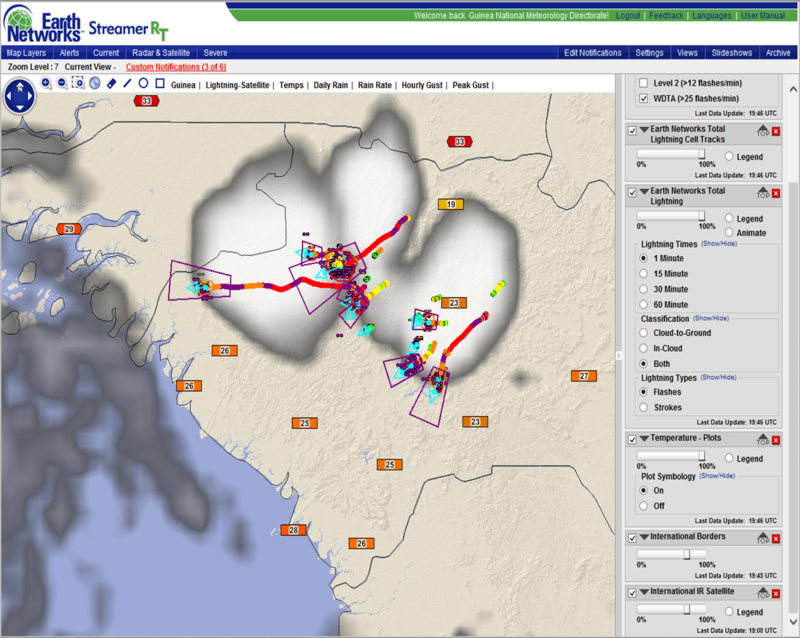 Simulated radar based on the total lightning detection shows strong storms in NW Guinea. An almost daily afternoon occurance lately. Meteorologists tracking the storms expect them to begin to develop around noon-time and slowly move westward. The storms have been noted to have life spans of a couple hours as storms die and reform. Typical storms can drop 25-50 mm of rainfall in an hour. Total rainfall over the past 7 days in this region can also be estimated by the meteorologist using the PulseRad simulated radar. 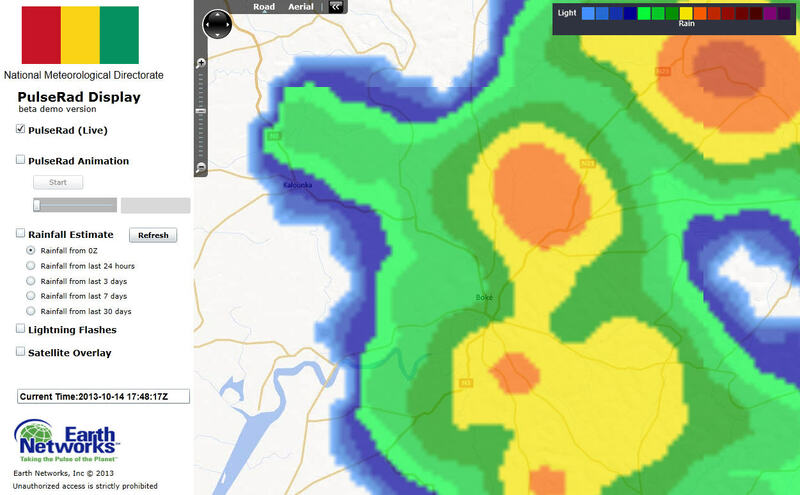 Radar reflectivity is translated into estimated rainfall at the surface. 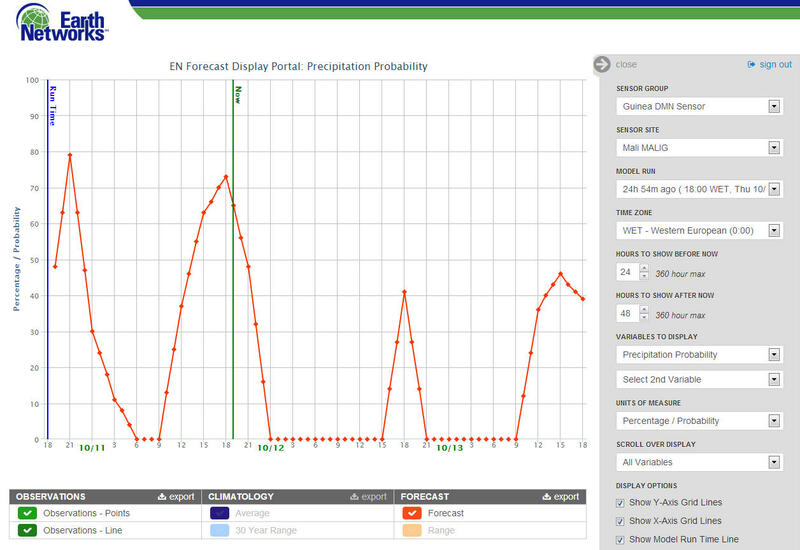 Meteorologists have been able to use this system to show that parts of Fouta Djallon have had 150 – 200 mm of rain in the past 7 days and are very prone to flash flooding as new storms approach. 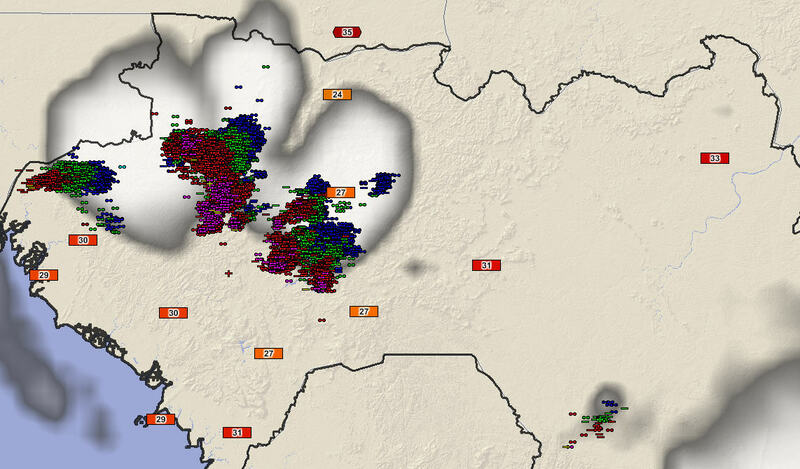 Simulated radar based on the total lightning detection shows strong storms in NW Guinea. An almost daily afternoon occurance lately. Rainfall totals the past seven days have exceeded 200 mm in part of Fouta Djallon. 29 October 2013, 17:00 UTC: Typical afternoon storm development has become severe across the northwest portion of Basse Guinea as storms developing across the hills and highlands have interacted with a steady sea breeze that has pushed inland from the Atlantic. Simulated Radar shows very strong storms developing. Guinea meteorologists have been monitoring the simulated radar system, PulseRad to determine the locations of the most severe storms. 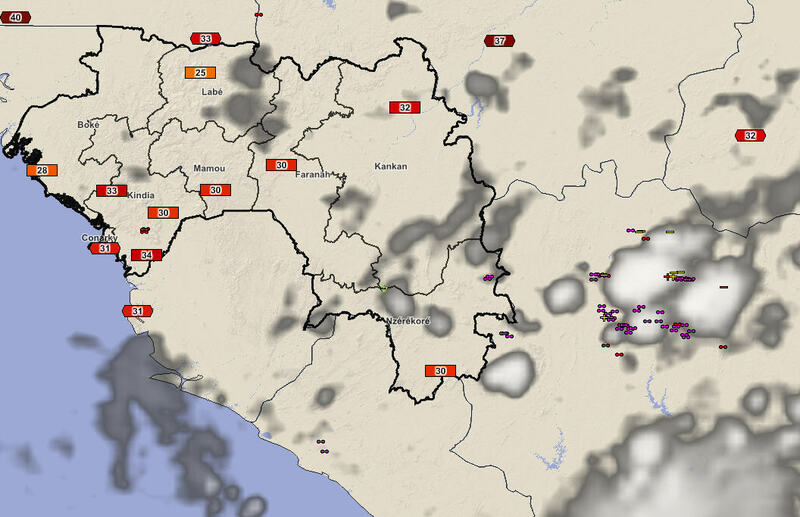 Very strong storms in the prefectures of Fria, Boffa and Dubreka have been determined to be severe based on measurements taken by the Guinea Total Lightning Detection Network. The automated network generated Dangerous Thunderstorm Alerts (DTA) for several strong storms in the area. The lightning rates detected in these storms were determined to reach a frequency to cause the meteorologists to be concerned they would be producing flooding rainfall rates, gusty winds and very frequent lightning. The strongest of the storms had automated Dangerous Thunderstorm Alerts issued based on thresholds exceeded determined by the Total Lightning Detection Network. The strongest storm was tracking north-northwest into Boffa and south of the city of Fria. This storm was likely producing flash flooding and gusty winds over 50 km/hr. Image shows the strongest of the storms and the associated Dangerous Thunderstorm Alert that was automatically issued. The storm had shown a steady increase in lightning frequency over the past hour. 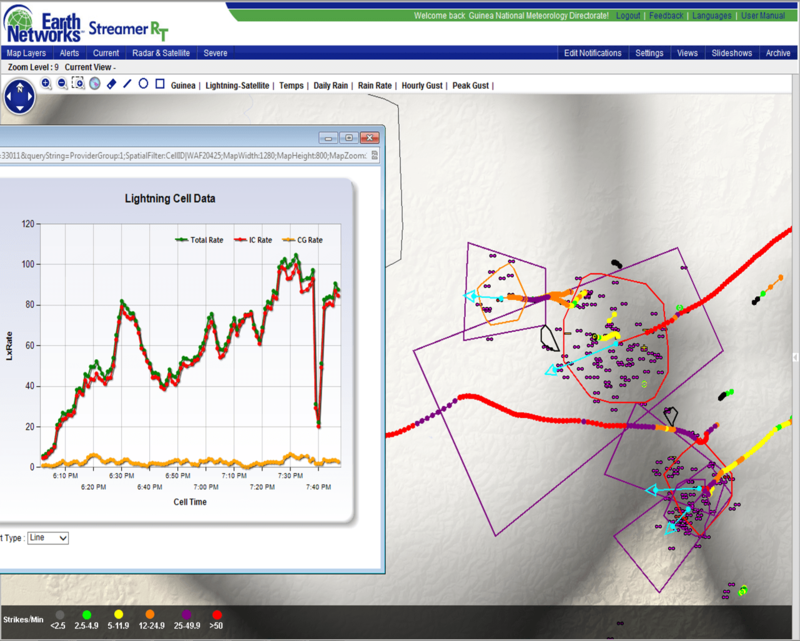 Lightning rates had approached 60 flashes/min. Meteorologist monitoring the storms have noticed a pulsing nature of the storm cells with storms weakening and dissippating over a time period of 2-3 hours. New storms continue to be expected to develop, track northwestward and decay till about 1 hour after sunset, after which all activity should decrease rapidly. 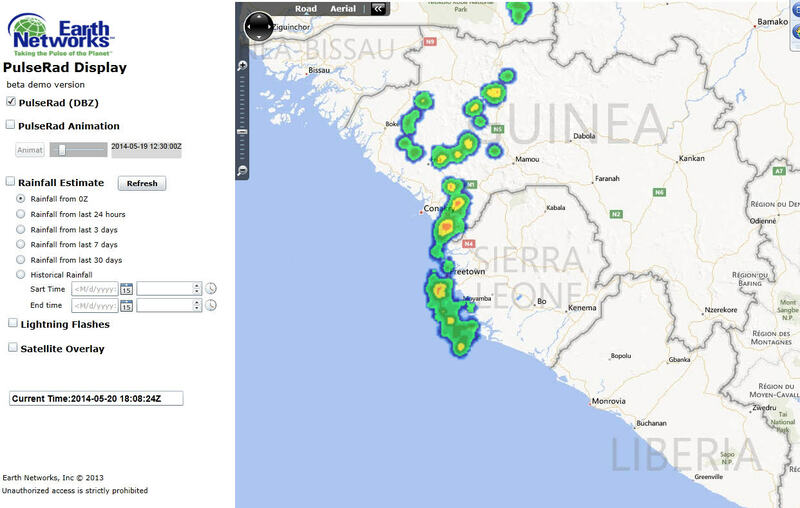 The Guinea Meteorology Directorate’s Total Lightning Detection System shows that lightning rates can be tracked in individual storms to determine the severity. 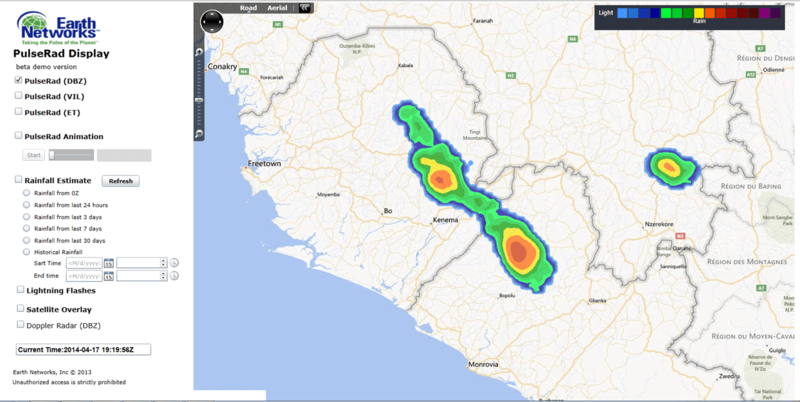 22 October 2013, 20:45 UTC: Storms that have developed over Moyenne Guinea and Basse Guinea have tracked westward all afternoon and evening, and once again as in the last few days, a storm storm is entering Fria and Dubreka Prefectures. The city of Fria was put under a Dangerous Thunderstorm Alert by the Guinea Meteorological Department around 8:20 p.m. for a strong storm approching from the east. 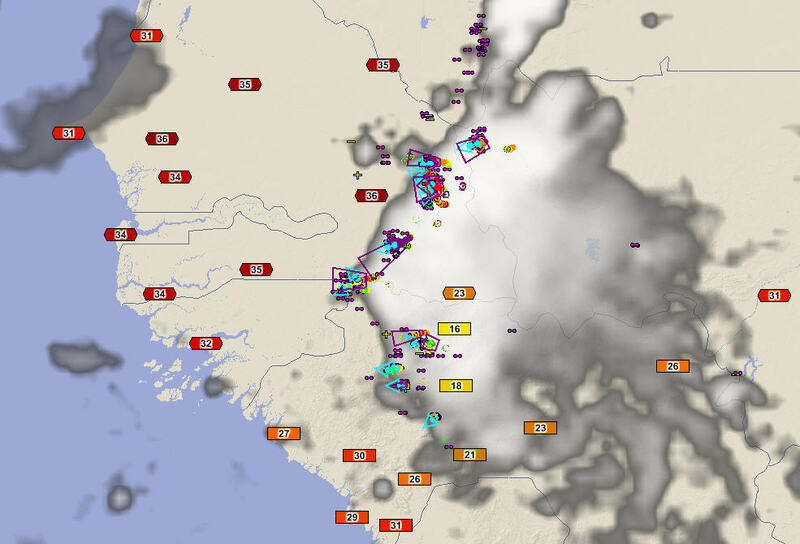 The Guinea Total Lightning Network detected massive amounts of intracloud and cloud-to-ground lightning in the storm and the PulseRad system showed the strong storm via simulated radar. PulseRad, or simulated radar shows the strong storm hitting Fria. The storm was producing rain rates in excess of 50 mm/hr and causing flash flooding in the city as predicted by the Dangerous Thunderstorm Alert. The storm also produced a wind gust at the live automated observing station in Fria recorded at 77 km/hr. The storm is forecast to continue over the area for the next 45 minutes and could produce up to 2″ of rainfall during that time. We are is tracking a very large and dangerous thunderstorm that is impacting the Fria region. The storms could impact Boke and the Conakry region in the next 2-3 hours. This storm is likely producing intense rainfall with flash flooding and could also have dangerous wind gusts. 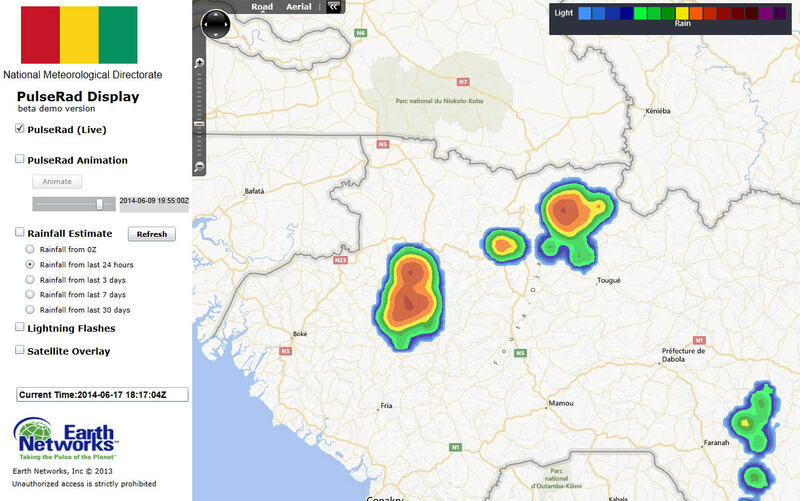 16 October 2013, 17:00 UTC: Once again, Guinea meteorologists are monitoring storms that have formed over the hills of Basse Guinea. These storms formed in the same region as yesterday and have taken a similar route, tracking westward toward Boke and Sangueya. Guinea PulseRad was showing a cluster of very intense storms just west of these cities at 5 p.m. local time. 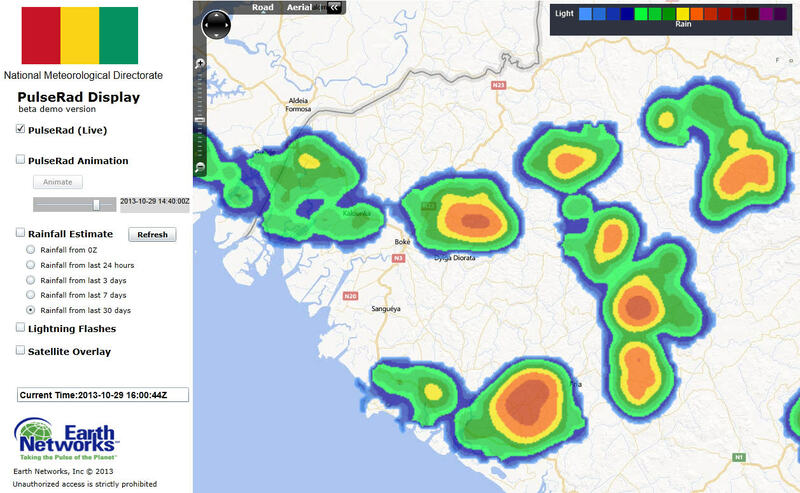 Strong storms approach coastal cities in northwest Basse Guinea. 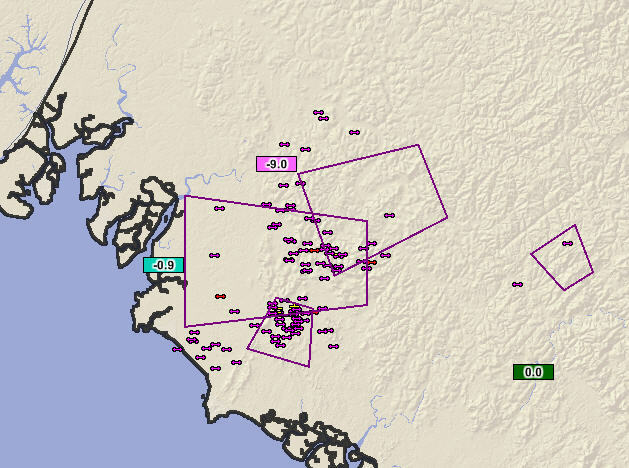 Storms were producing very frequent lightning, and the rates were high enough to have Dangerous Thunderstorm Alerts (DTAs, purple polygons) issued for these areas. Guinea Total Lightning system issued Dangerous Thunderstorm Alerts for the storms moving toward the coast. The Guinea live observation network was recording rapidly changing weather conditions as temperatures dropped 9 degrees C over an hour as rain fell at rates exceeding 50 mm/hr. Storms produced temperature falls of 9 degrees C over an hour. There was a very damaging storm this morning. It is reported that many houses were damaged by wind gusts. The TV station antenna was destroyed during the event. 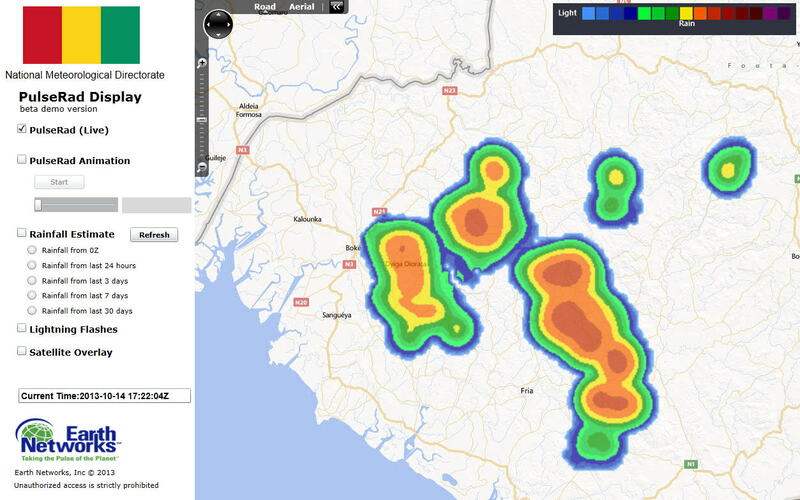 Storm cells were tracked as they approached Conakry and the rapid evolution of this particular thunderstorm over the city was tracked and Dangerous Thunderstorm Alerts were generated. 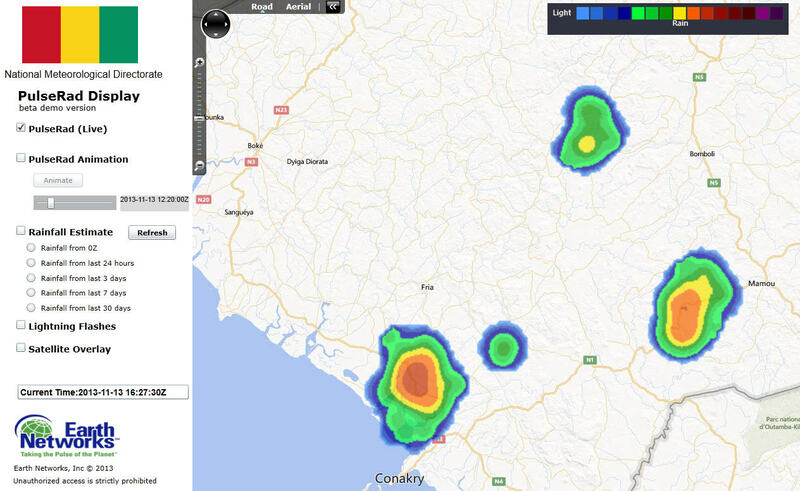 Modest thunderstorms approached Conakry from the south, southeast starting at about 0120 UTC. 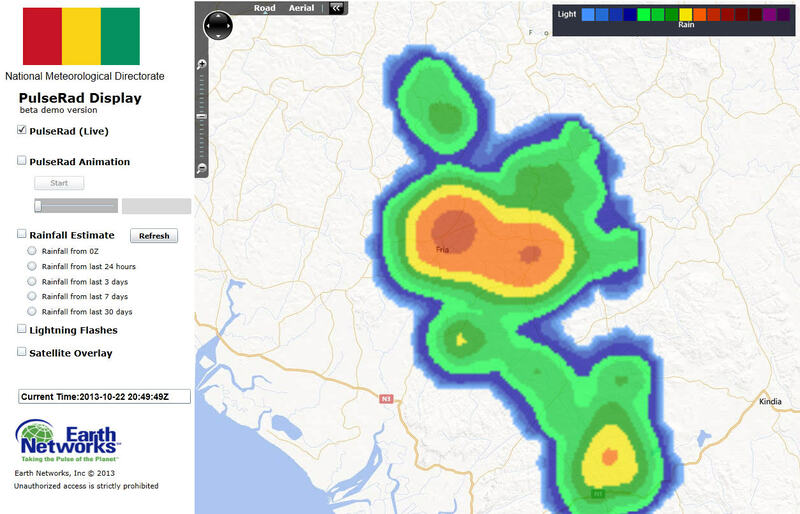 At ~0230 UTC a new storm developed and rapidly intensified over NE Conakry. A DTA was issued for Conakry at ~0235 UTC. 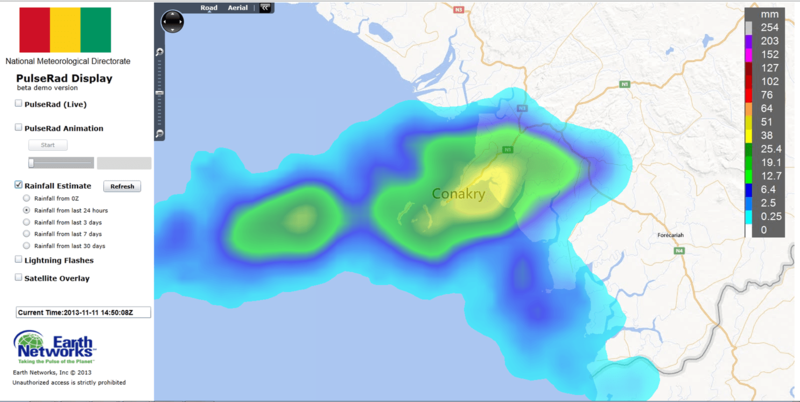 The storm continued to intensify and expand west and south into the heart of Conakry over the next 30 minutes. 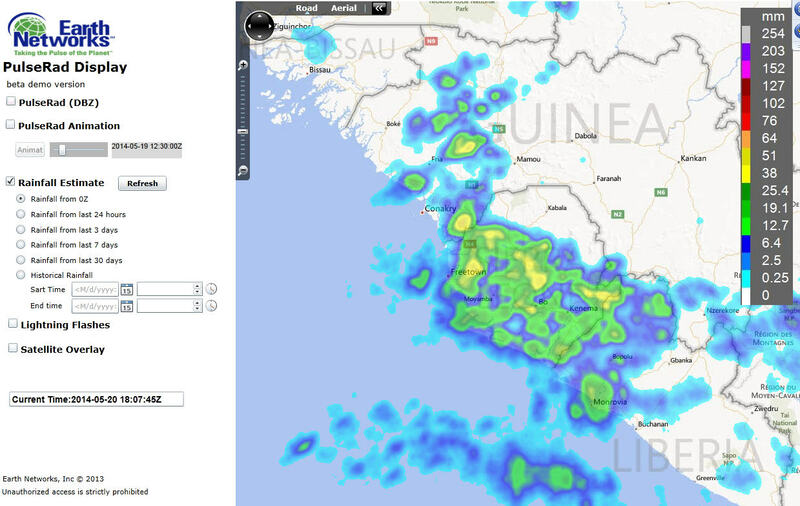 By ~0330 UTC the storm had diminished and departed Conakry to the NW. There certainly could have been flash flooding and damaging winds between ~0245 UTC and ~0315 UTC. 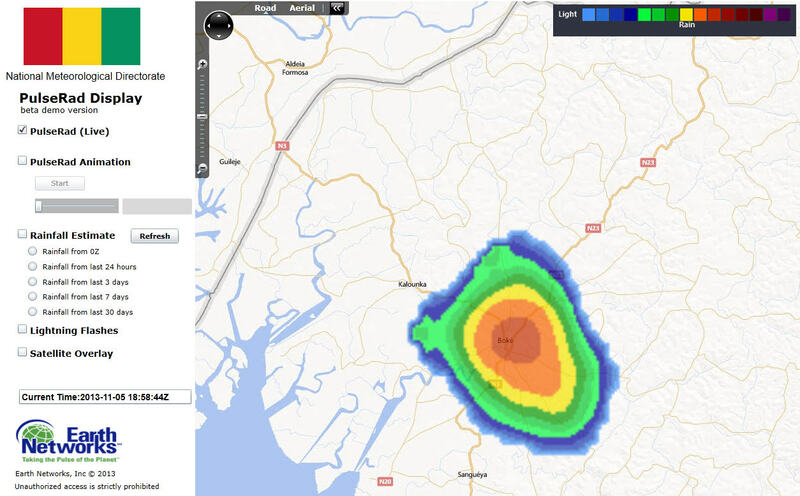 14 October 2013, 18:30: Late this afternoon the Guinea Meteorological Service was able to issue a Dangerous Thunderstorm Alert (DTA) 20 minutes before a strong storm roared into the city. The DTA issuancewas possible due to the Guinea Total Lightning Detection Network. DTAs warn for frequent lightning, very heavy rain, and gusty winds. rain rates exceeded 80 mm/hr. The observation system also recorded extreme rainfall amounts. Amounts exceeded 80 mm/hr at times. Flash flooding is common with rain rates of this magnitude. The total lightning network allows for the Guinea meteorologists to track strong storms using PulseRad, a simulated radar based on intracloud and cloud-to-ground lightning rates. 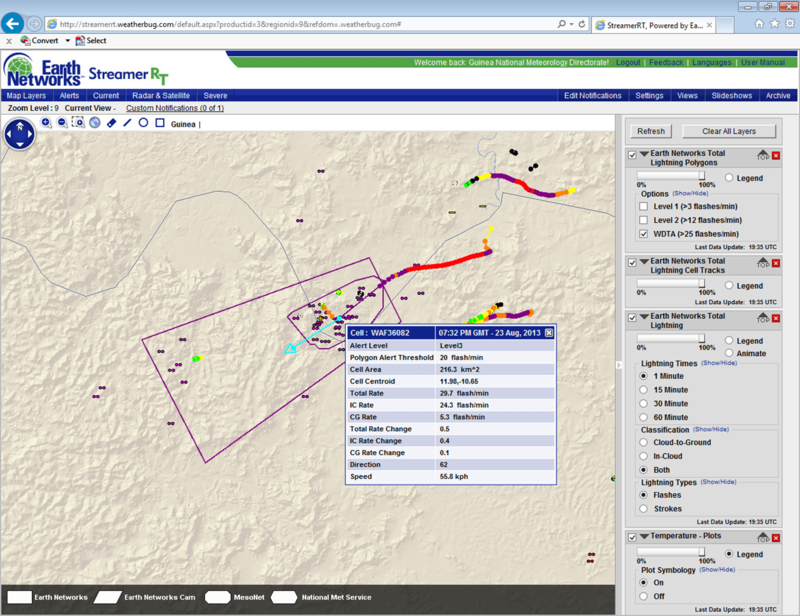 The image shows the strong storm on PulseRad as displayed through visualization software as it was affecting Fria. 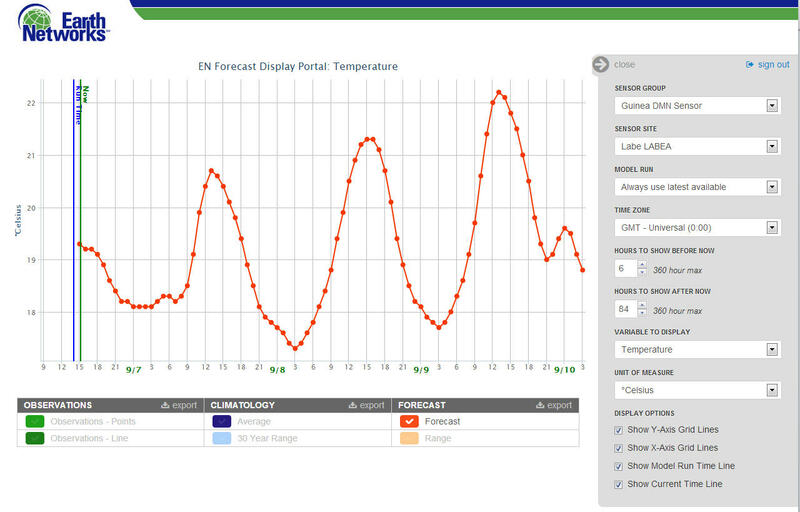 The visualization system also shows meteorologists up to the second temperature and rain reports. Temperatures dropped 8 degrees C as the storms approached. Wind gust were recorded around 60 km/hr. Image shows a strong storm with frequent lightning moving into Fria. A Dangerous Thunderstorm Alert Polygon overs the area to be affected by the storm. The image shows a wind gust value of almost 60 km/hr that occured as the storm moved into the city. 14 October 2013, 17:30 UTC: Once again, another upper-level energy impulse is being tracked by the Guinea Met Service using the Total Lightning Network and analysis tools. 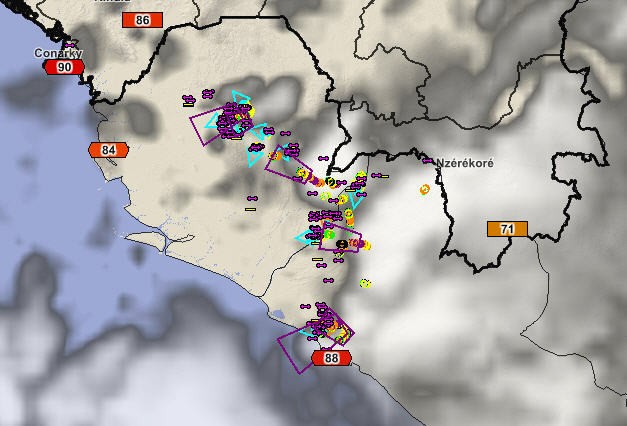 This line of showers and storms has been tracking very slowly from Moyenne and Haute Guinea toward the coastal Basse Guinea region.Simulated PulseRad radar tracked the strongest of the storms moving out of the hilly region east of the coast. The storms were producing vivid frequent lightning, heavy rain with some flash flooding and also gusty winds. Radar shows area of strong storms tracking toward the coast between Boke and Fria. 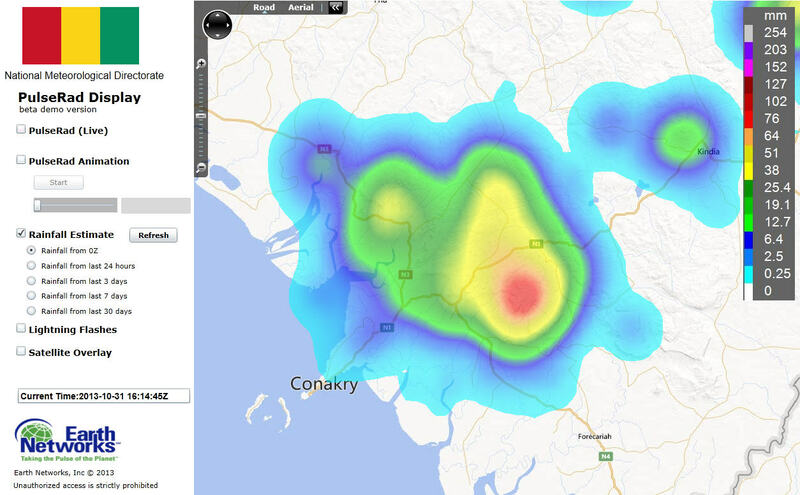 Rainfall was very heavy, over 100mm in some locations east and southeast of Boke. Many areas had over 50mm from storms that moved very slowly westward. 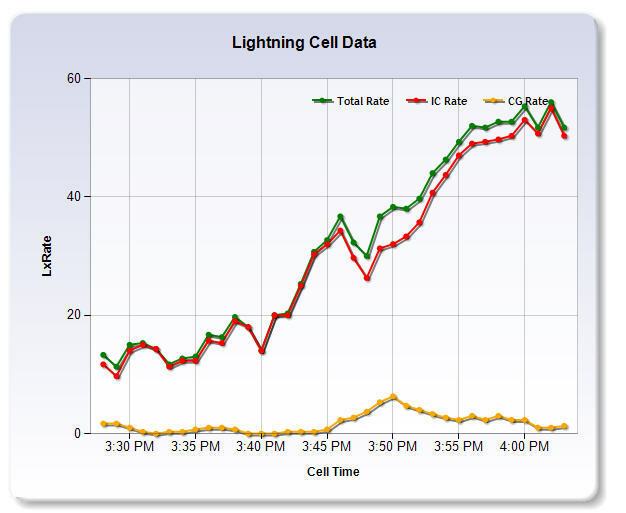 Total lightning system calculates storm rainfall based on flash rates. Meteorologists were watching Dangerous Thunderstorm Alerts (DTAs) that had been automatically issued based on lightning rates detected by the total lightning networks. These alerts included areas just to the south and east of Boke. 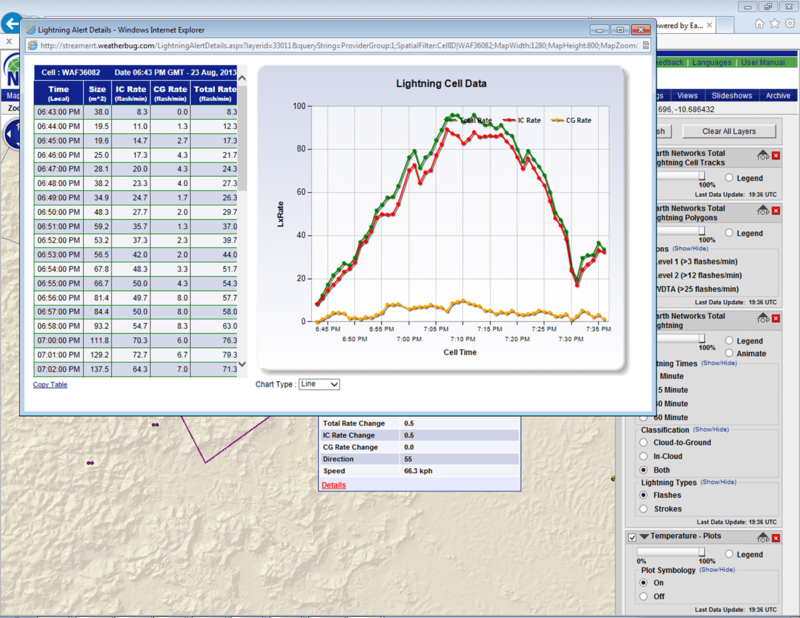 Analysis system uses lightning rates to automatically issue Dangerous Thunderstorm Alerts (DTA). Guinea Meteorological Service ENcast forecasts, had shown a steady increase in thunderstorm probabilities in the forecast throughout the day. Forecasts called for the highest probability of storms for around 18:00UTC, almost exactly when the storms moved into Boke. 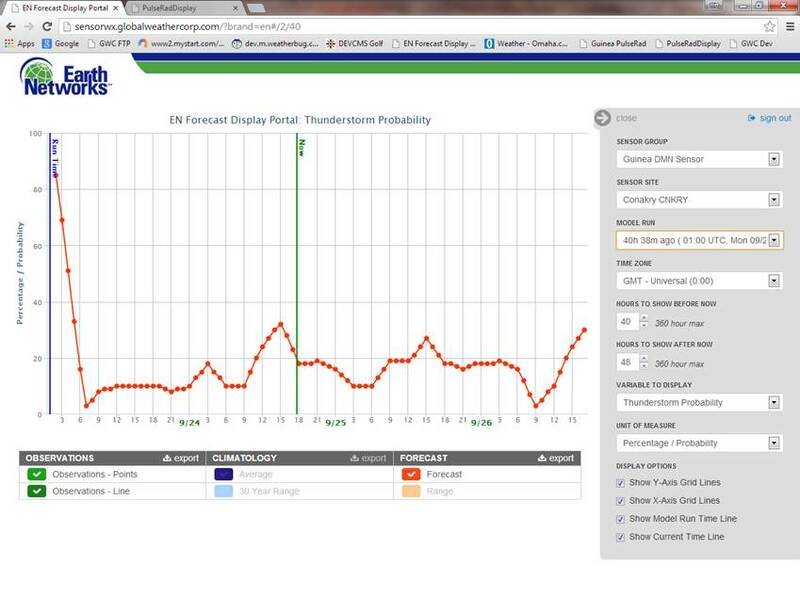 ENcast Forecasts had been showing a steady increase in thunderstorm probabilities leading up to the afternoon storms. 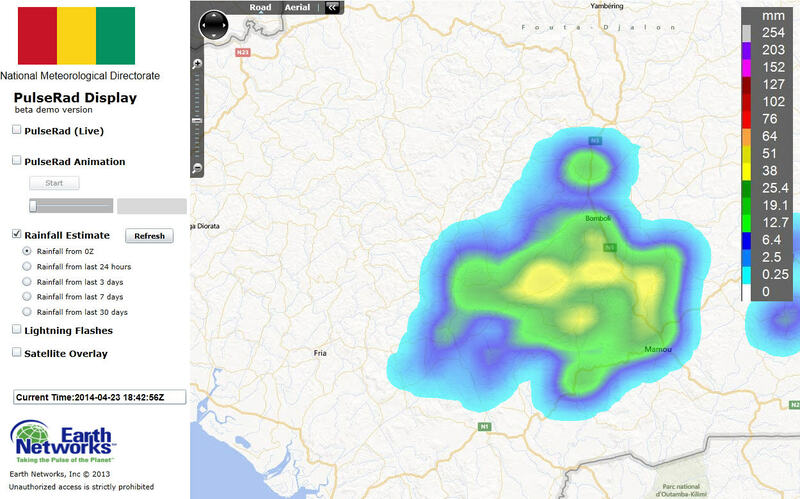 PulseRad shows that the heaviest of the storms were passing north and south of the city center of Boke. PulseRad simulated radar shows the heaviest storms passing just north and just south of the city center. Even though the heaviest of the storms were being tracked to the north of Boke, rain rates were still impressive, 15-25 mm/hr rates in the city center. Analysis tools shows that parts of the Boke metro areas are under DTAs and the plotted value shows rain rates exceeding 15 mm/hr. North of the city, rain rates were exceeding 50mm/hr. 2013 October 11, 16:00 UTC: A westward moving impulse along the Inter-Tropical Convergence Zone (ITCZ) caused a large area of strong thunderstorms to develop this afternoon. 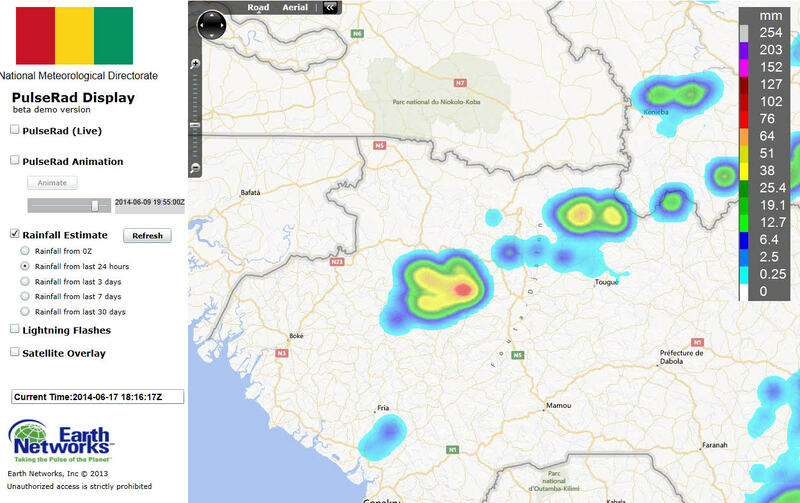 The storms were located across northern Guinea and into Senegal and Guinee-Bassau. Storms were moving into a very hot and unstable air mass. The storms were feeding off a very warm and unstable air mass located over the region. Temperatures were over 30C and some near 40C with high humiditiy. A westward moving impulse along the Inter-Tropical Convergence Zone (ITCZ) is shown here with infrared satellite, and lightning data. Storms were moving into a very hot and unstable air mass. 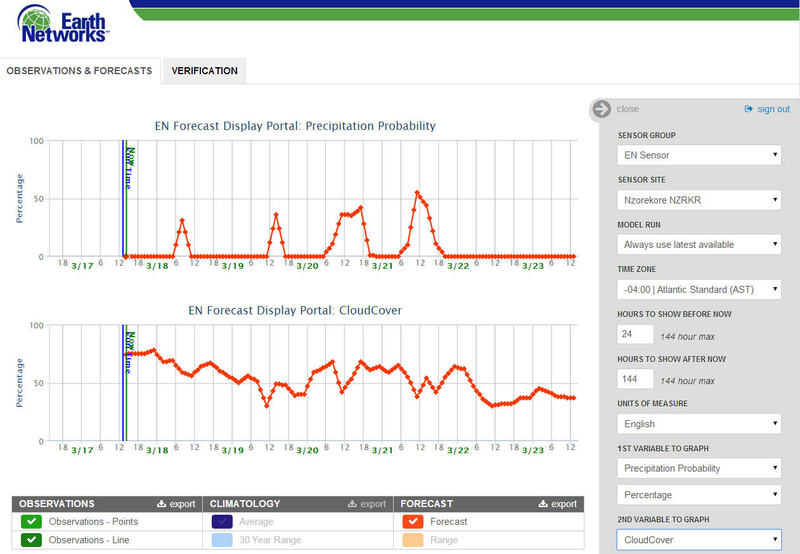 ENcast hourly forecast shows that the rainfall experienced this afternoon in Mali was well forecasted yesterday. 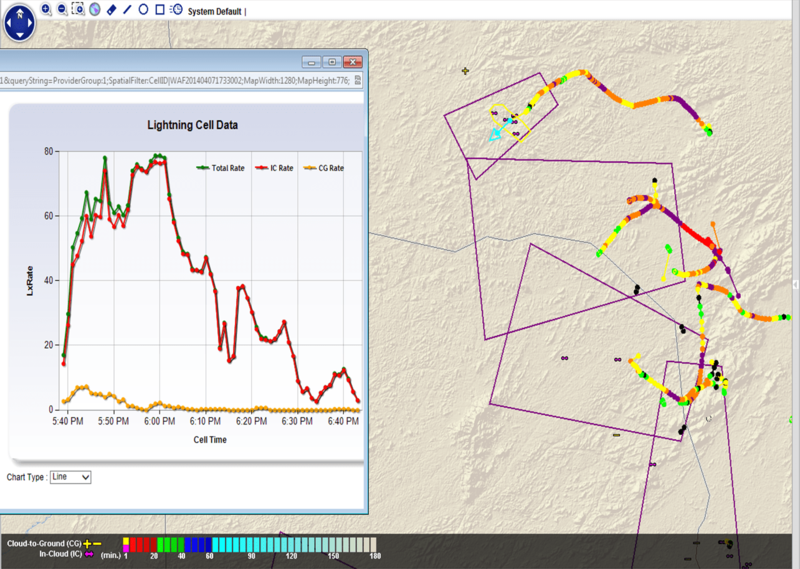 Storm intensity is shown through a graph of lightning rate for a storm in NW Guinea. Rates were strong enough to cause a Dangerous Thunderstorm Alert to be issued. 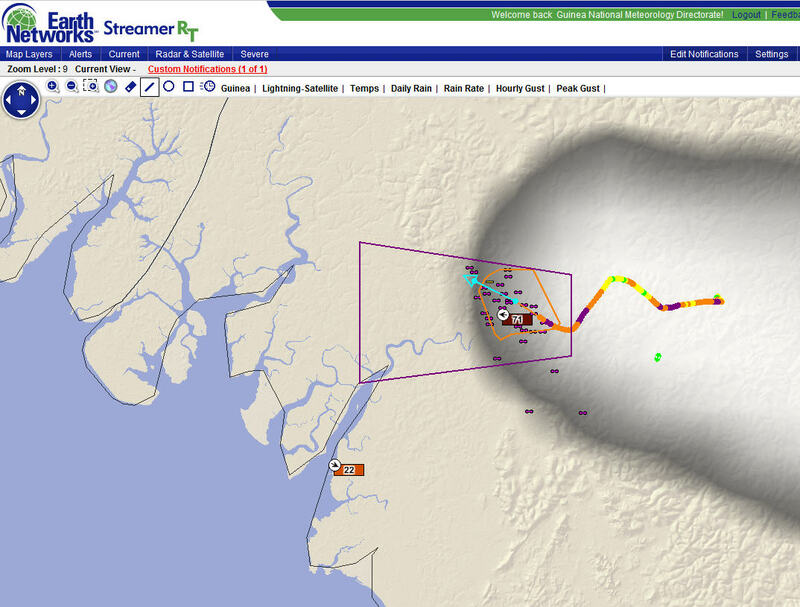 The Guinea Total Lightning Detection System shows the speed, intensity and direction of strong storm. Simulated radar using the total lightning data is able to depict the strongest storms as they move out of northern Guinea into Senegal and Guinee-Bassau. In the northern prefecture Koundara four people were killed by lightning. The first part of this video playback shows all the lightning activity for the duration of the storm event. 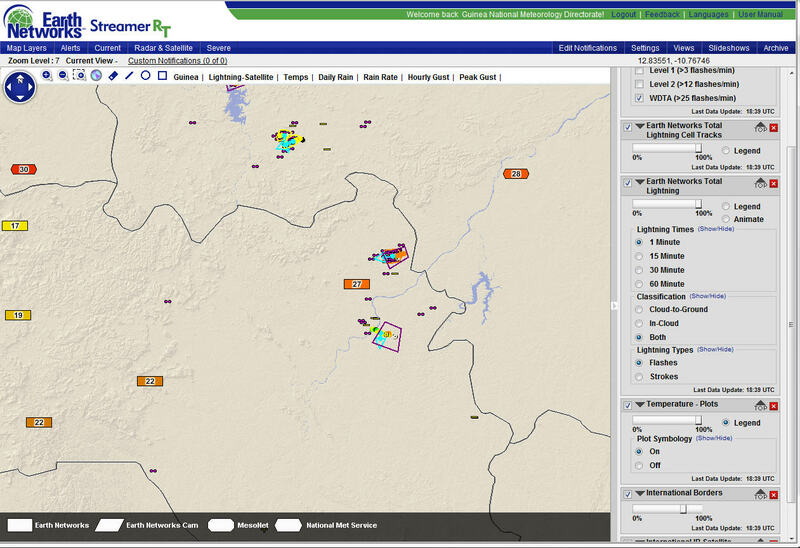 The second part shows the automated lightning cell tracking and Dangerous Thunderstorm Alerts. The district could take advantage of several DTAs as the storm arrived and moved through. 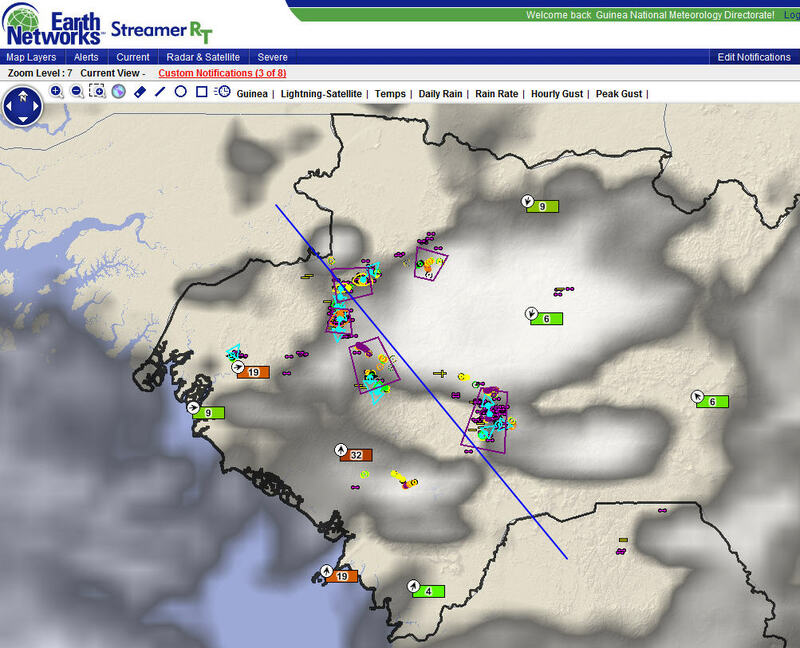 1 October 2013, 15:15 UTC: A line of storms that developed over Haute Guinee and Moyenne Guinea has been steadily moving westward throughout the afternoon. The storms moved through Mali between 13:00 and 15:00 today and dropped temperatures from 20.5C to 13.1C. The storms also dumped from 10-40 cm of rain over roughly 90 minutes. Graph shows temperature profile for Mali over the last 2 days (green) with precipitous drop occurring this afternoon as storms rolled through. Forecast shows temperatures will rebound some before dark. 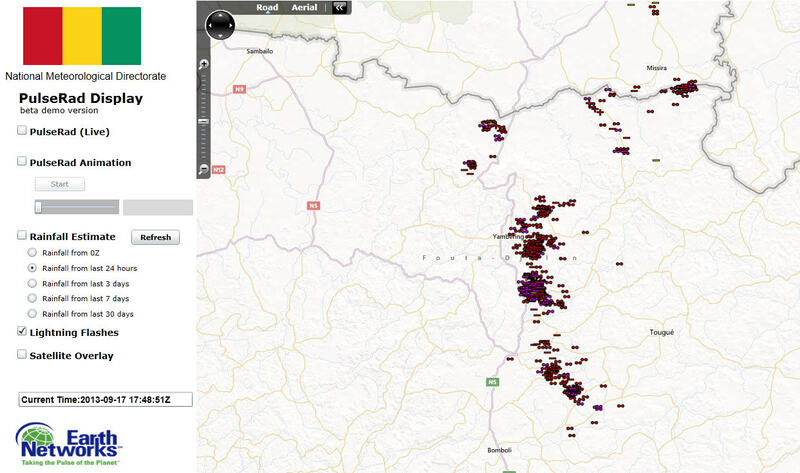 Visualization system shows lightning associated with storms across the western half of Guinea. Purple polygons indicate areas under Dangerous Thunderstorm Alerts for heavy rain and frequent lightning along with some gusty winds. 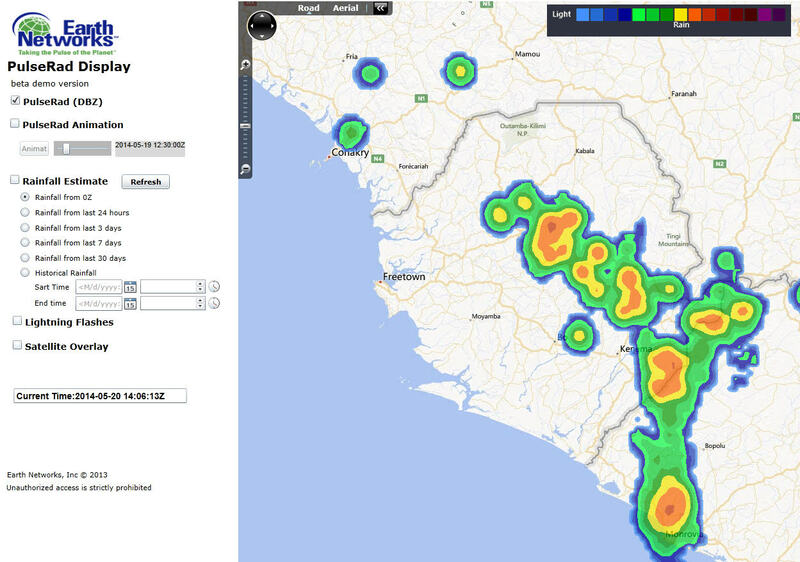 Radar also showed a line of storms forming inland along a sea breeze front in Basse Guinea. These storms will continue to develop and drift slowly west. The additional storms moving out of the highlands to the east could act to enhance these coastal storms and create even more intense displays of lightning and rainfall after sunset. PulseRad proxy radar shows strong storms moving out of the highlands as well as a line of sea breeze thunderstorms in western Guinea. 26 September 2013 15:00 UTC: This afternoon, Guinea meteorologists have been tracking an upper level disturbance moving westward across southern Mali and Northern Guinea. This disturbance has been producing a strong line of thunderstorms that have been generating very frequent lightning, gusty winds from 40-60 km/hr and very heavy downpours. Proxy radar has tracked the steady movement of the storms for the last 3-4 hours. Our forecast continue to call for these storms to maintain strength as the move through Eastern Senegal and Moyenne Guinea. PulseRad shows where most intense storms were located at about 3 p.m. local time. Rainfall has been ranging from 15 – 50 mm from these storms that have dropped the rain in about 1 hour. Map shows rainfall estimates of up to 25 mm from storms in just a short period of time. The area of instability is moving into an area that has been very warm today and has plenty of instability to keep this line of storms very active with continued severe weather potential. 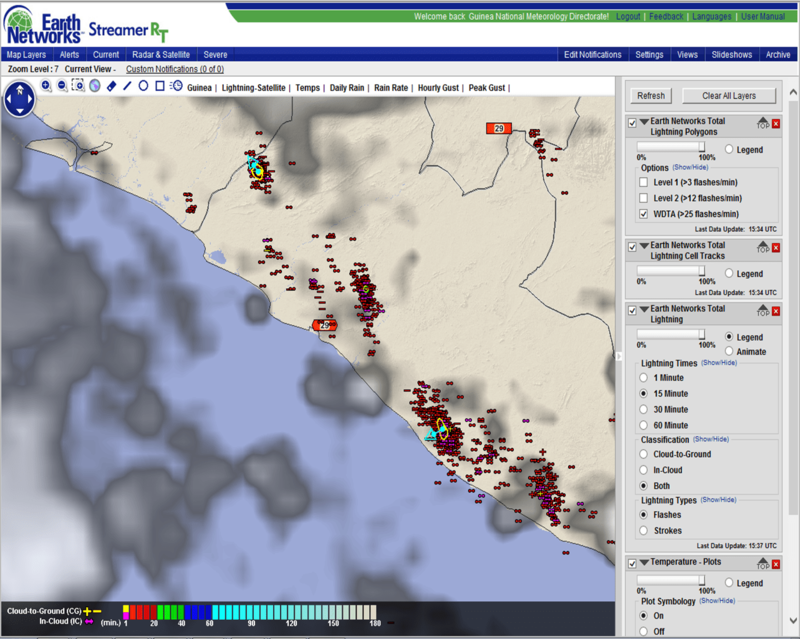 Visualization software shows total lightning detection at 3 p.m. local time and tracks of severe cells. Current air temperatures are plotted. Notice very warm and unstable airmass over Senegal. Purple polygons are Dangerous Thunderstorm Alerts indicating areas of the most severe weather in the area of storms shown in the infrared satellite image. Areas to the west will be affected by these storms over the next 4-5 hours with the continued potential for frequent lightning, winds gusting from 40-60 km/hr and flash flooding due to heavy downpours. 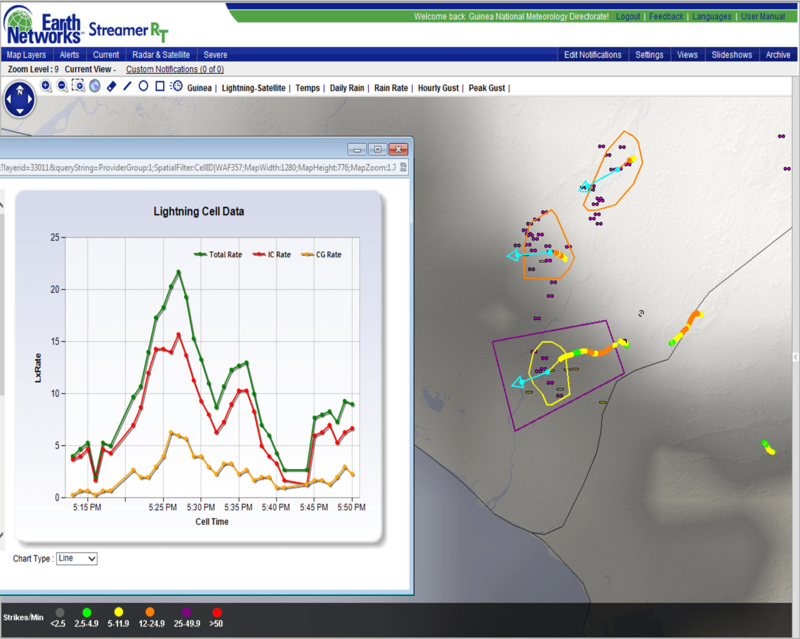 Visualization software shows total lightning detection at 3 p.m. local time and tracks of severe cells. Peak gusts are plotted. Purple polygons are Dangerous Thunderstorm Alerts indicating areas of the most severe weather in the area of storms shown in the infrared satellite image. There appears to have been a very damaging storm this morning. It is reported that some houses were damaged by heavy rain and wind gusts. This video containing PulseRad proxy radar imagery and Dangerous Thunderstorm Alert boxes clearly shows all the activity for the duration of the storm. 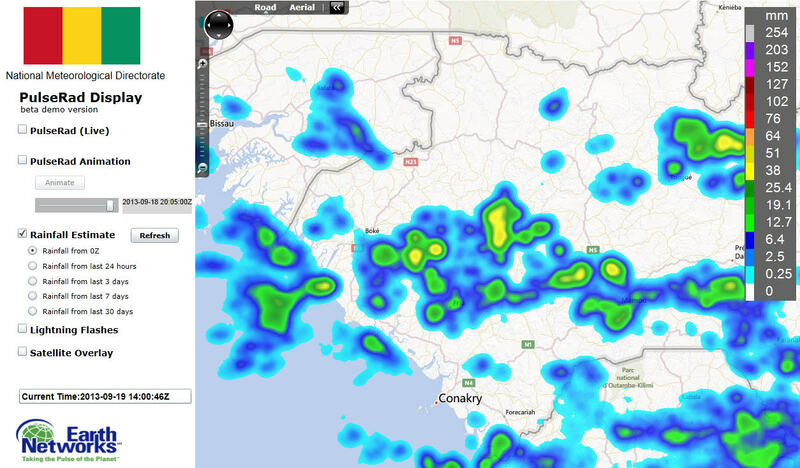 Conakry could take advantage of several DTAs before the storm arrived. The verified storm report confirms the Early Warning System functionality. 23 Sept 2013, 2000 UTC: After a day that saw copious amounts of sunshine and temperatures rising to some of the highest levels of the month (Daily high temperatures shown below) strong storms developed over the Moyenne Guinea region late this afternoon and this evening. Our total lightning network tracked strong thunderstorms moving out of the northern highlands that were producing very frequent lightning, very heavy rain and gusty winds. 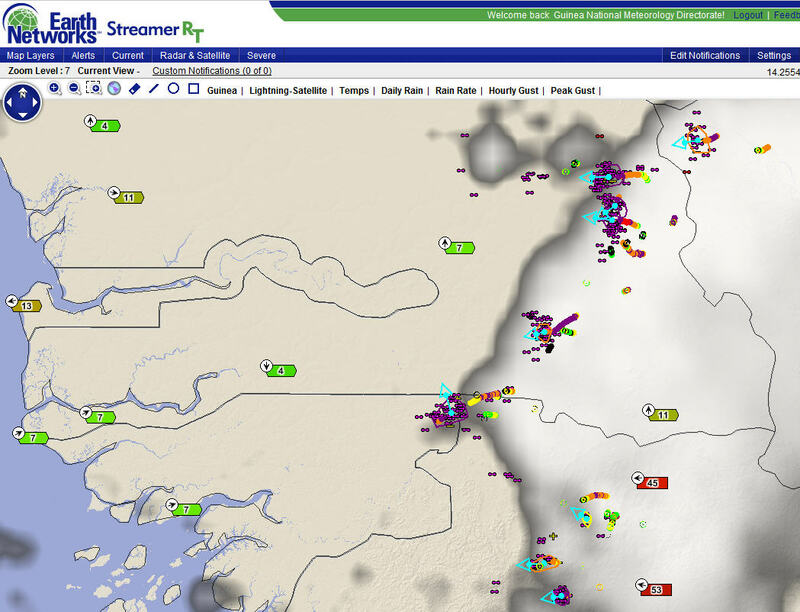 The image below shows the storm lightning cells that we tracked as the storms moved west and southwest. Dangerous Thunderstorm Alerts were issued as the storm lightning rates pushed over 40 strikes/min and even over 100 strikes/min. The graph below shows the history of one of the more impressive storms. 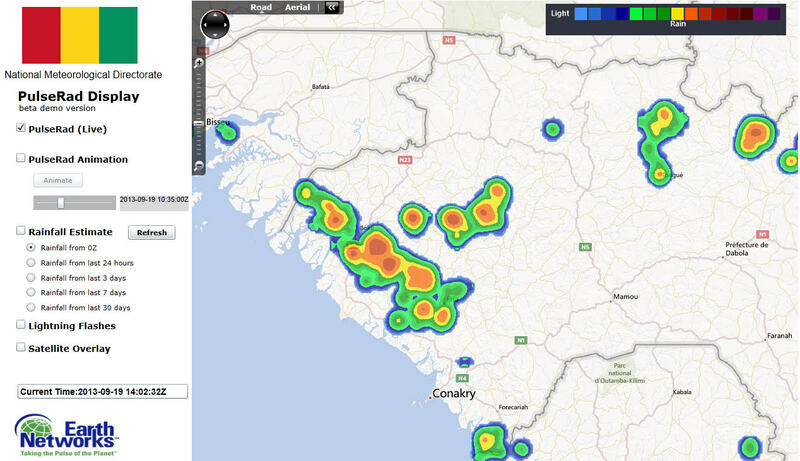 Lightning was dominently intracloud which can be detected by the Guinea Total Lightning Sensor Network. and is critical to understanding the intensity and severity of thunderstorms. Our PulseRad proxy radar tracked some impressive rainfall rates with these storms. Many areas had 25-50 mm with a couple locations going over 75 mm in just a 2-3 hours this evening. 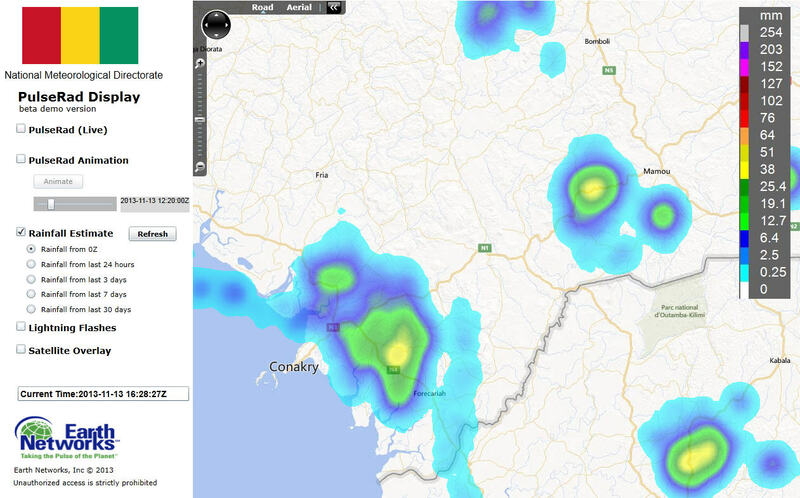 23 September 2013, 12:00 UTC: Very intense late night thunderstorms developed along a sea breeze front near Conakry just after midnight today. The Guinea Total Lightning Network began tracking these storms before 1 a.m. and began tracking the intensity and motion of them just ESE of the city. Meteorologists were able to quickly determine that the storms were tracking toward the city and were increasing in intensity rapidly through their analysis of lightning rates and lightning cell tracks. Meteorologists were also able to reference the hourly updating ENcast to verify forecasts for these same storms. Lightning data feeding into the forecast algorithms were showing nearly 100% chance for storms with intense rainfall likely over the next 2-3 hours. Images below show the forecasts leading up to the event. Ultimately, the storms rolled through the city between 2:30 and 4:00 a.m. Image shows the hourly forecast for thunderstorm probabilities for Conakry, Guinea. Thunderstorm probabilities were high for the period the storms moved across the city. 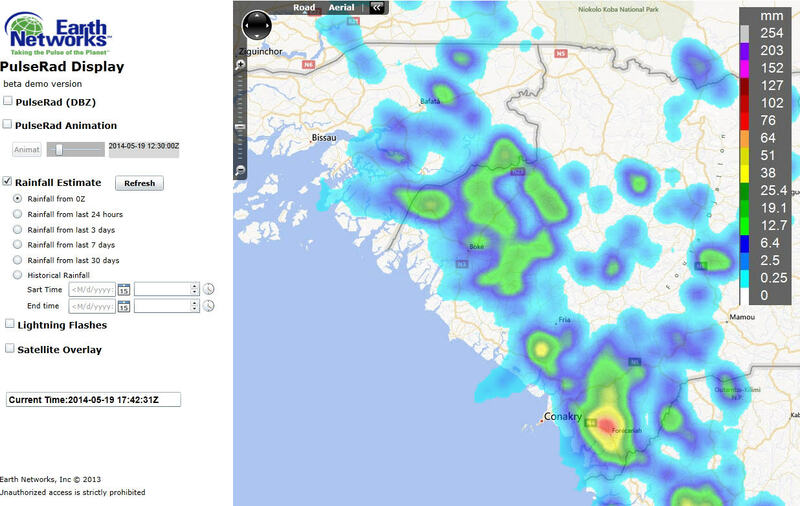 Image shows forecast probabilities for rainfall by hour for Conakry, Guinea. 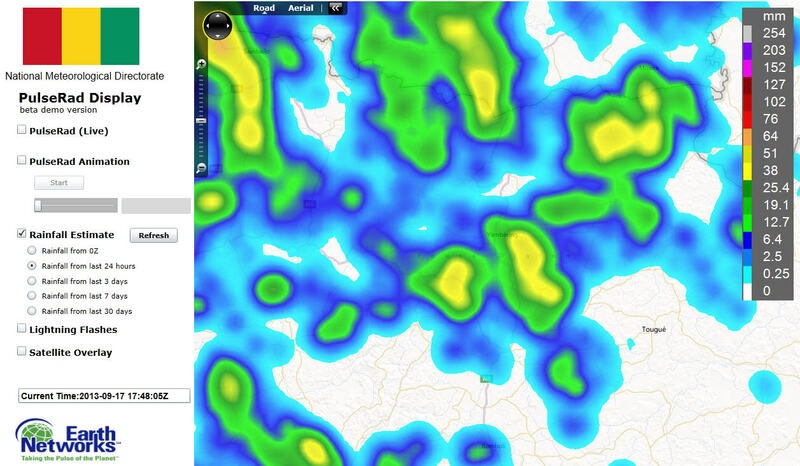 Image shows spike in forecasted rainfall expected during the forecasted thunderstorm passage. 19 September 2013, 14:00 UTC: An upper level system tracking along the ITCZ toward the coast of Guinea the last two days has been generating very strong storms early this afternoon. Our simulated radar shows siginificant rainfall is occuring and tracking slowly toward the coast. Storms have produced over 1″ of rain in a short period of time. Total rainfall so far this afternoon is shown in the image below. Areas to the west of these storms can anticipate similar amounts. These storms produced wind gusts over 80 km/hr in Labe and thousands of lightning strokes per hour. The image below shows peak wind gusts across the region and a plot of lightning detected by our network in just one hour. 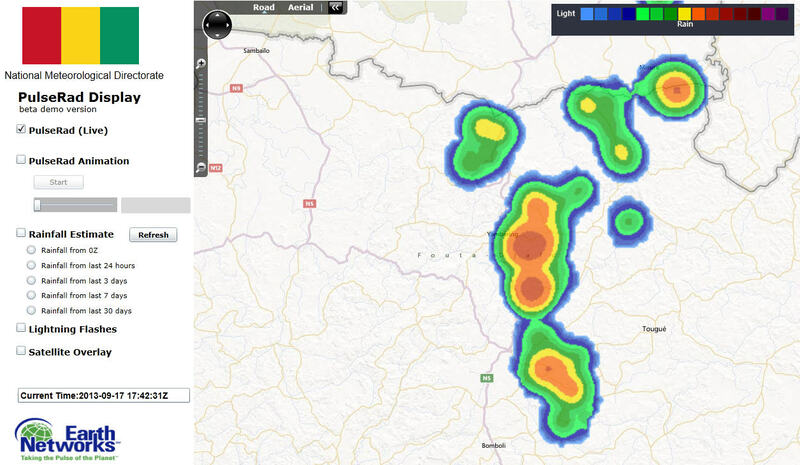 17 September 2013 – 17:45 UTC: Late this afternoon Guinea meteorologists have been tracking an area of strong storms that have been dumping very heavy rain (over 25-50 mm/hour) in the mountainous region of Fouta-Djallon and creating flash flooding as they moved through. Our lightning and simulated radar alerting system has shown very frequent lightning in this area. 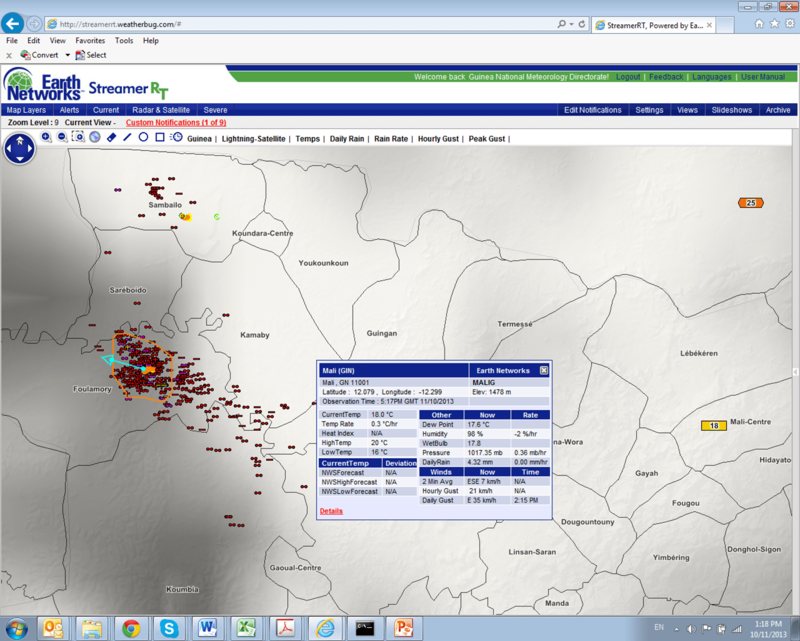 The image below shows substantial lightning occuring between 16:45 and 17:45. Based on this substantial lightning, simulated radar is showing that the strongest storms are between Tougue and Yamberling in the Highlands. These storms are causing flash flooding and gusty winds as they move into Yamberling and toward Labe. Our precipitation estimates for rainfall so far today show that many areas have had 25mm of rain with some over 50 mm – most of which has fallen in just 60-90 minutes. 11 September 2013, 5PM UTC: Late this afternoon warm sunshine in the western coastal region (Haute Guinea) pushed high temperatures to 27 – 31 C which created a situation that cause a sea-breeze wind shift to push inland from off the cooler waters of the Atlantic Ocean. This wind shift created convergence areas in the warm humid air mass over the West that generated thunderstorms. The image below is a snapshot of this event underway. Satellite imagery cleary showed the storms along the eastern areas with plenty of warm sunshine remaining in the interior. 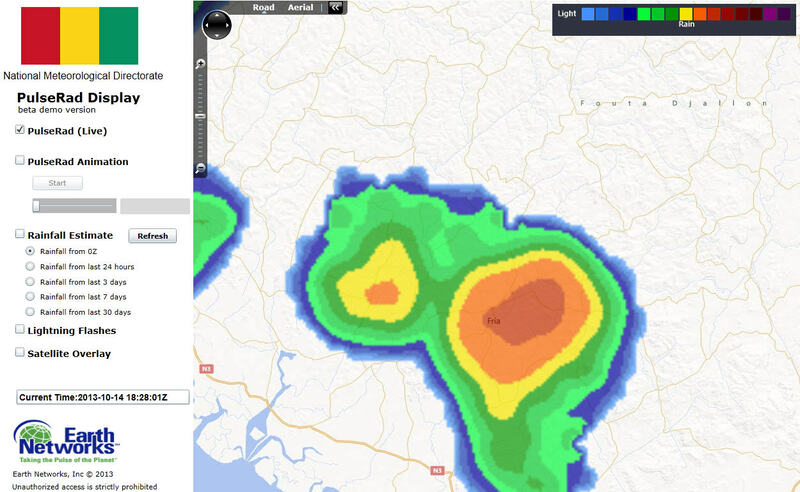 A strong storm near Kamsar generated very heavy rain, frequent lightning and a wind gust of 67 km/hr. Our total lightning detection system generated a number of Dangerous Thunderstorm Alerts warning of these occurences. These storms also dropped temperatures as much as 10 C in the locations they occured to as low as 20C. These storms will continue to develop and decay until 7pm UTC. 5 September, 19:00 UTC – We have watched strong, pulsating storms develop in the far NE, in the Suguiri and Mandiana Prefectures over the last hour. These storms have dropped over an inch of rain in an hour and are creating localized flooding. We have issued Dangerous Thunderstorms Alerts (shown as purple polygons below) for two storms in this region and others may develop. 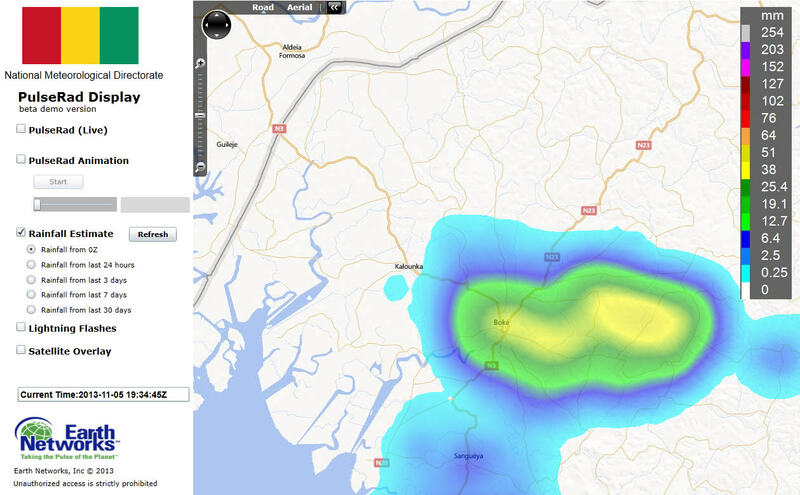 Image below shows rainfall that has fallen in the last hour. We have watched these storms on PulseRad and the image below shows the location of the strongest storms. This storm cell has rapidly developed into a severe storm. Lightning flash rates of 100 flashes per minute. Extremely heavy rain with flash floods and high winds likely when the rate drops. This storm cell has rapidly developed into a severe storm. Lightning flash rates of 100 flashes per minute. Extremely heavy rain with flash floods and high winds likely.